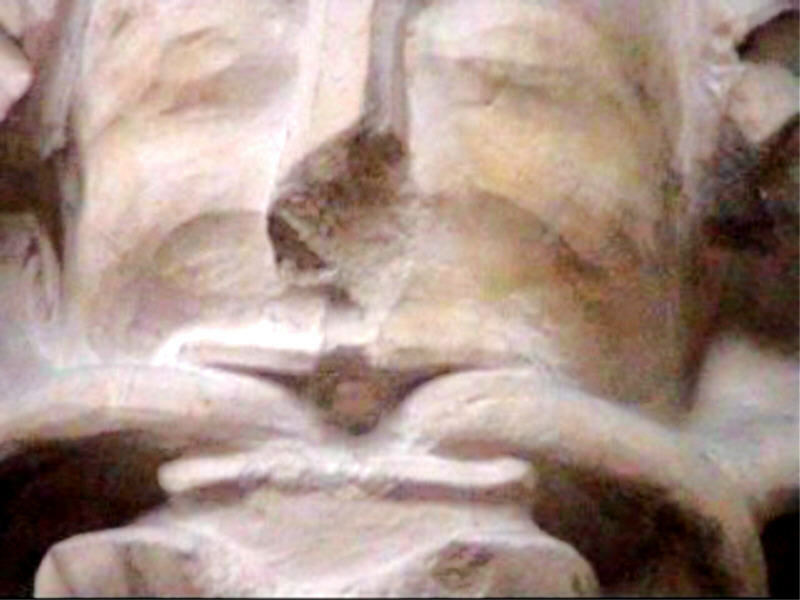 (which Owing to its Very Nature is in a Constant State of Construction & Revision). 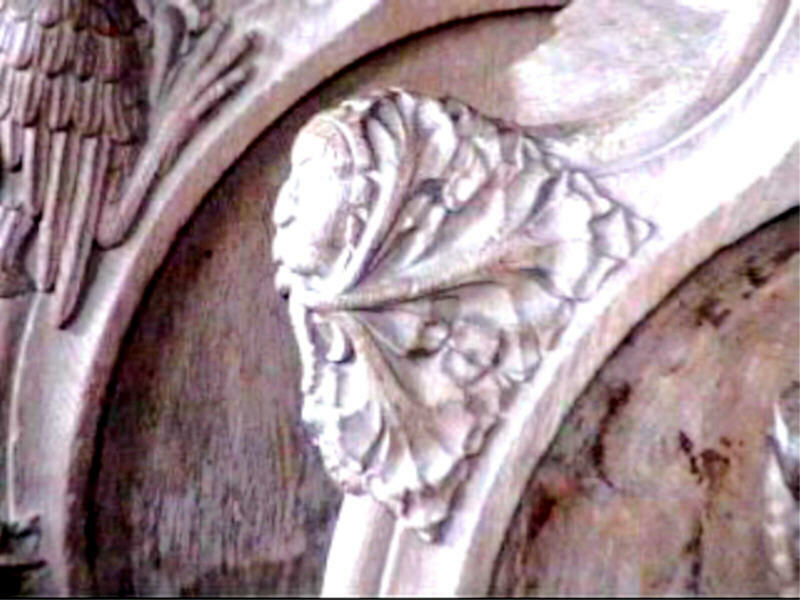 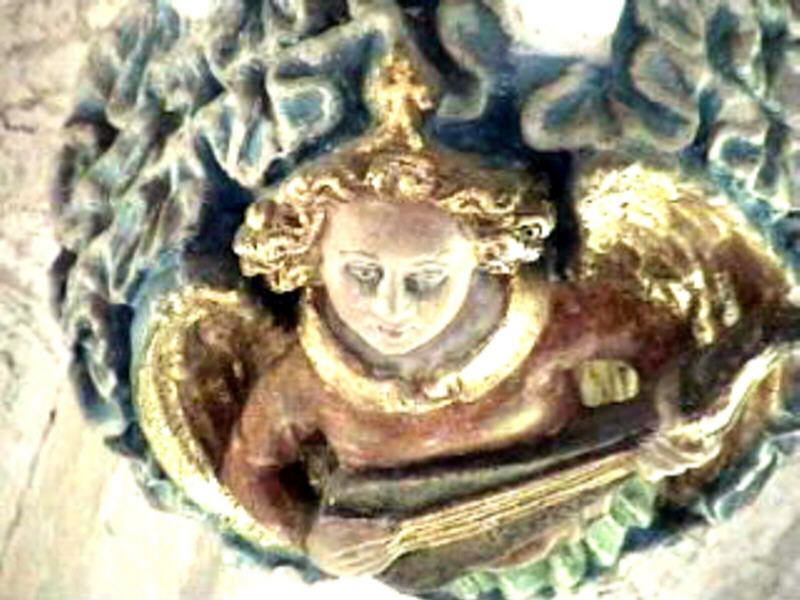 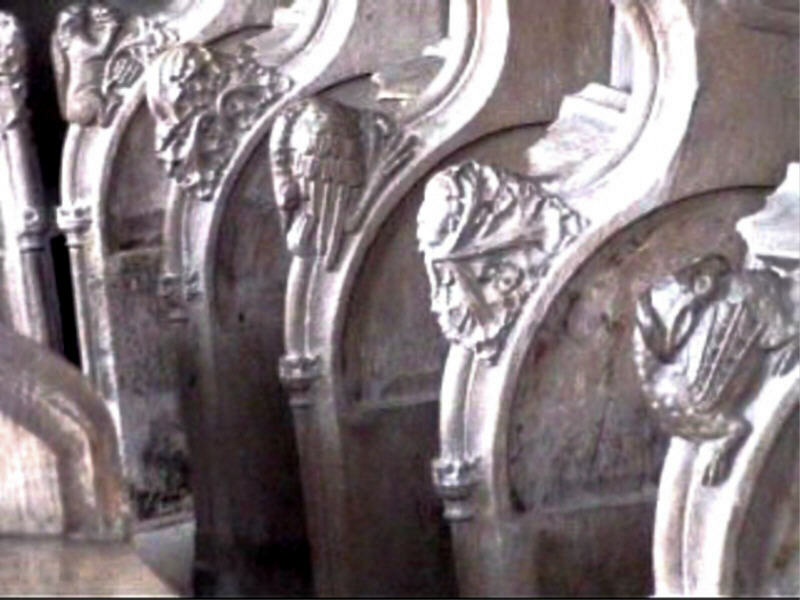 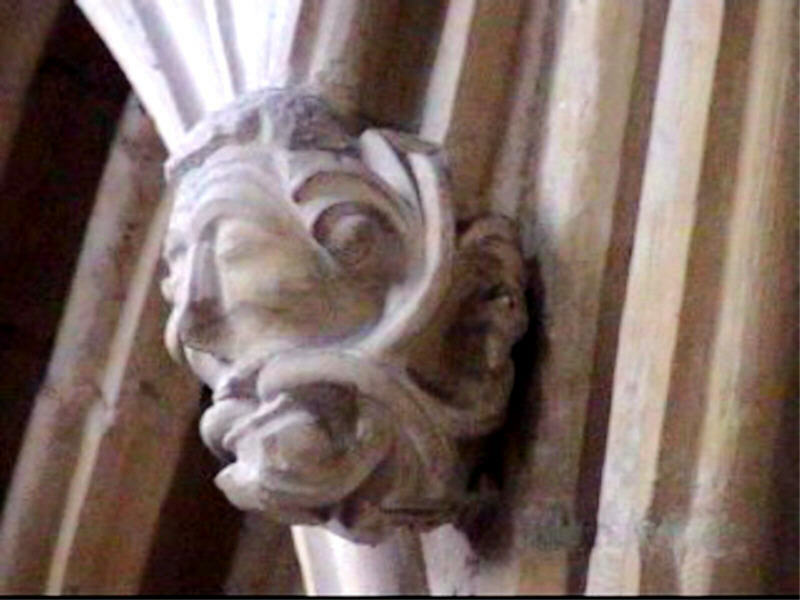 The title of this site comes from a 1950s guide book to Exeter Cathedral in which we find the term 'Head-with-Leaves', whilst in E. C. Le Grice's 'Norwich Cathedral - Its Interest and Beauty' (1945) the famous verdant visages of the cloisters are described as 'Foliage-and-Faces'. 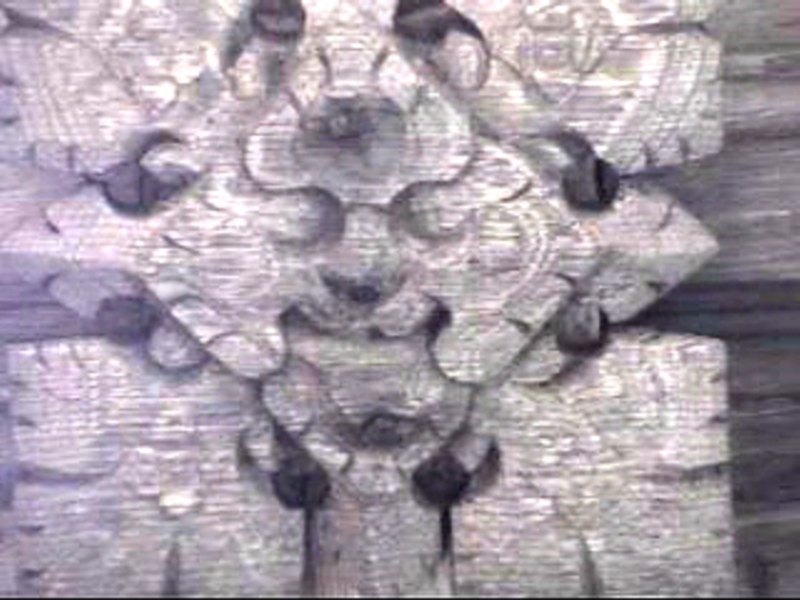 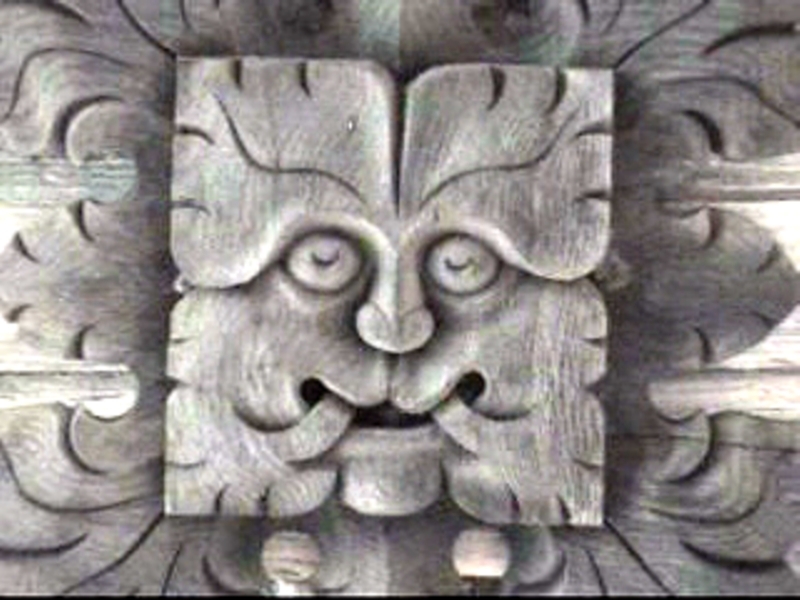 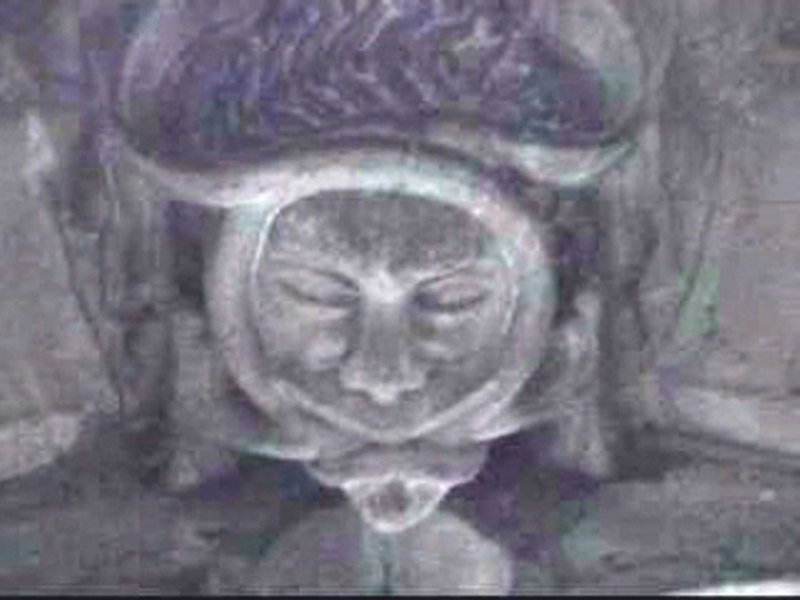 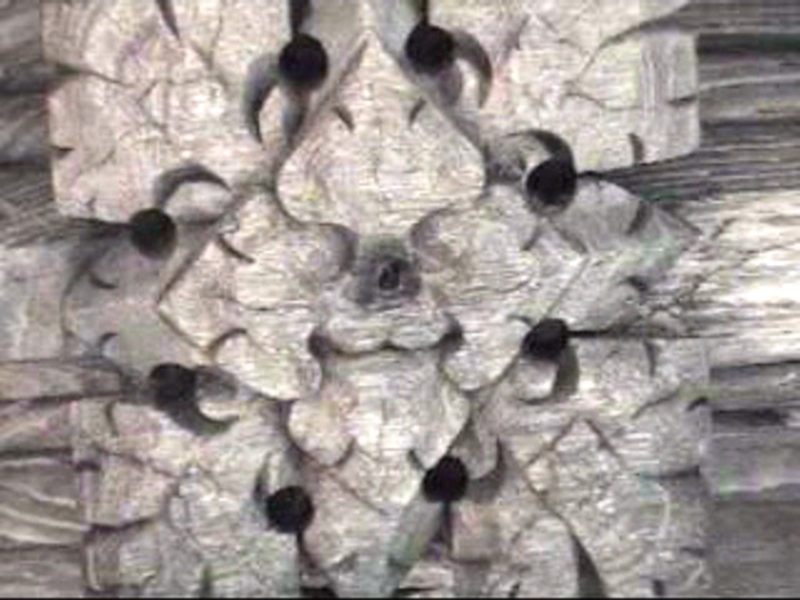 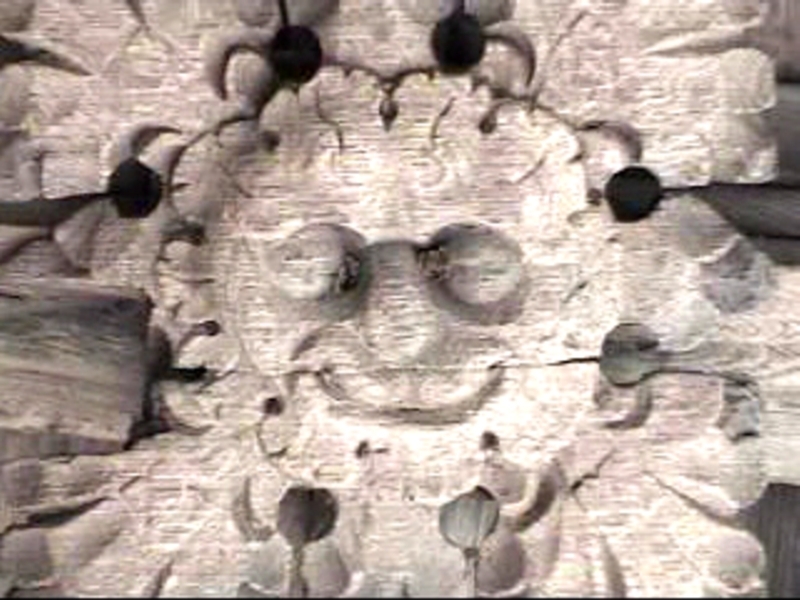 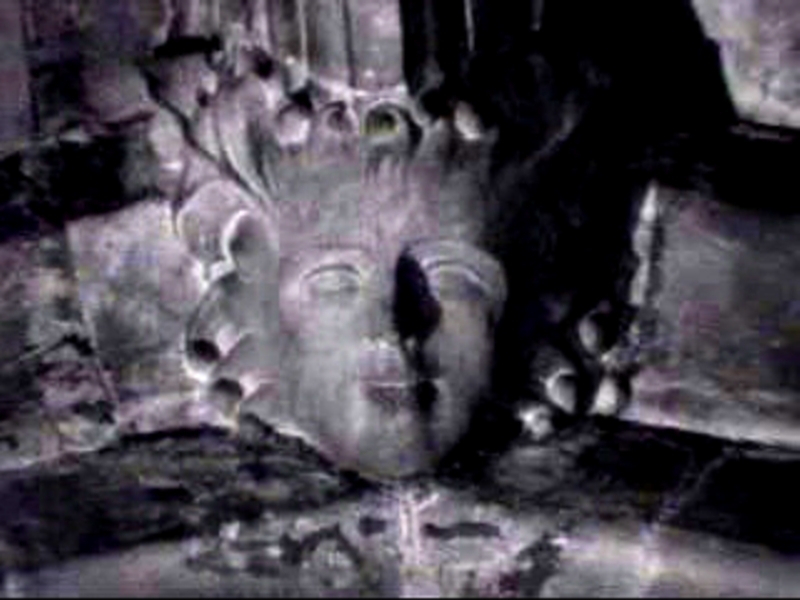 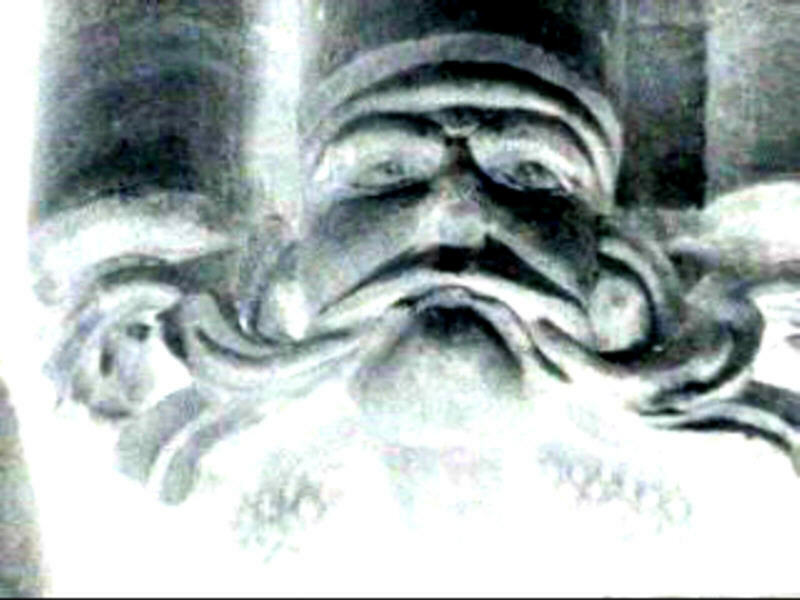 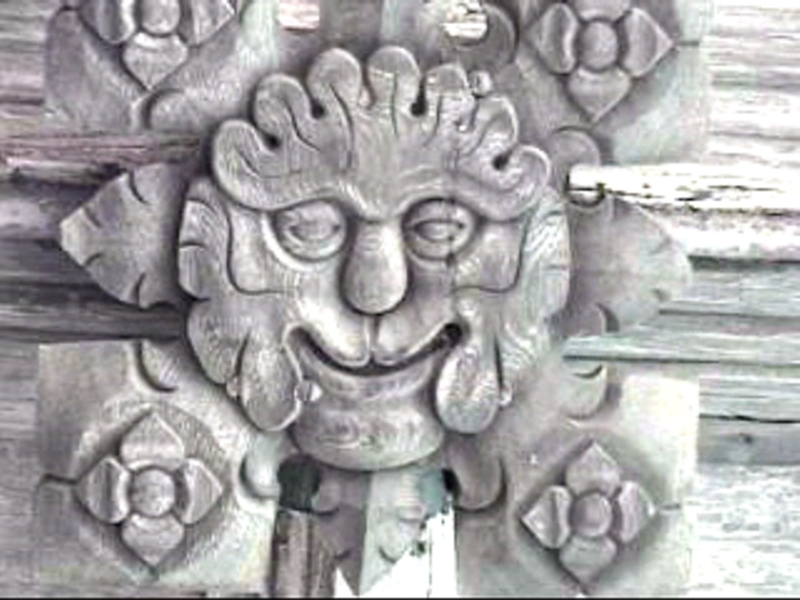 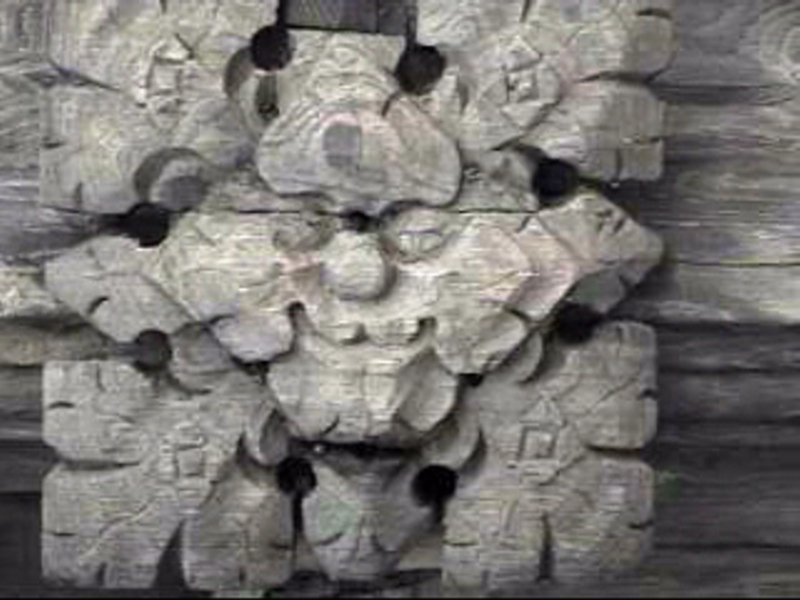 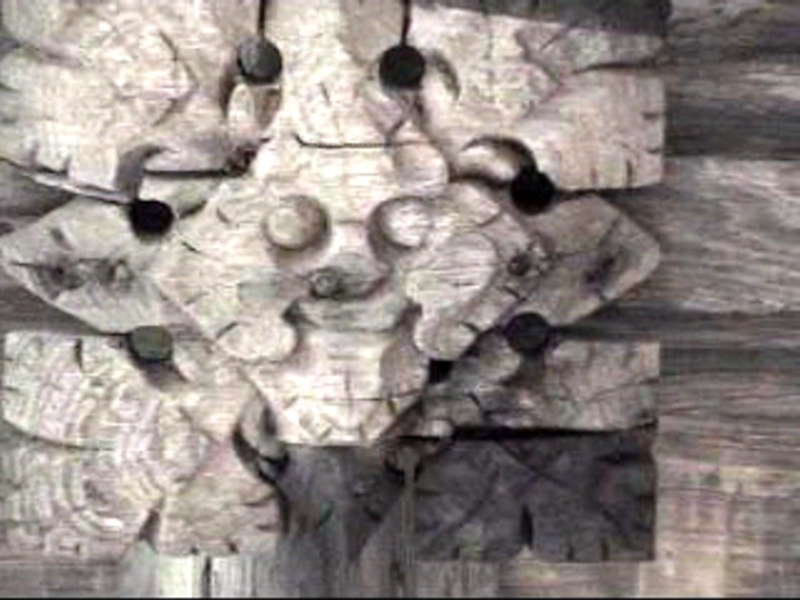 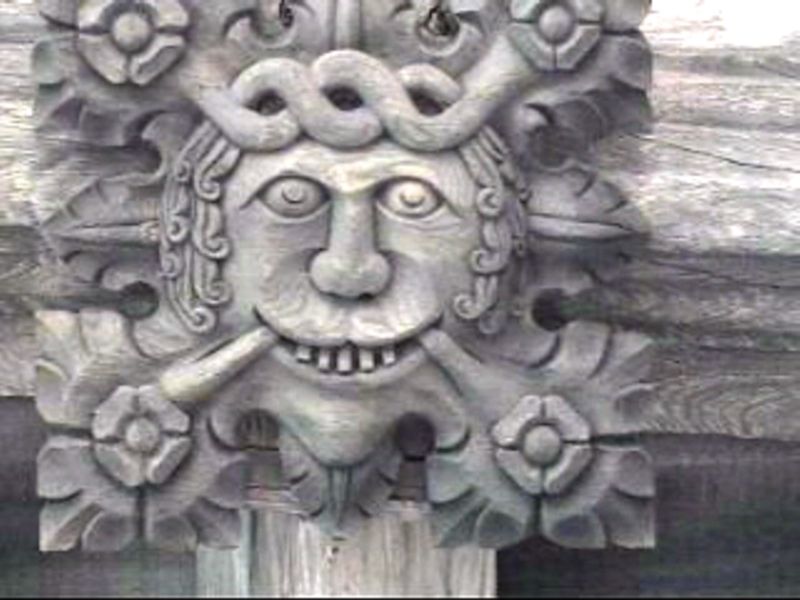 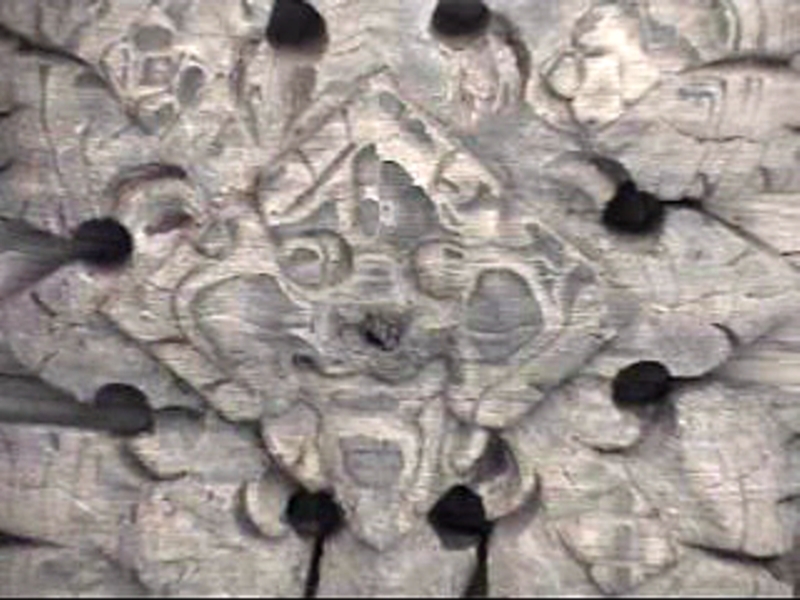 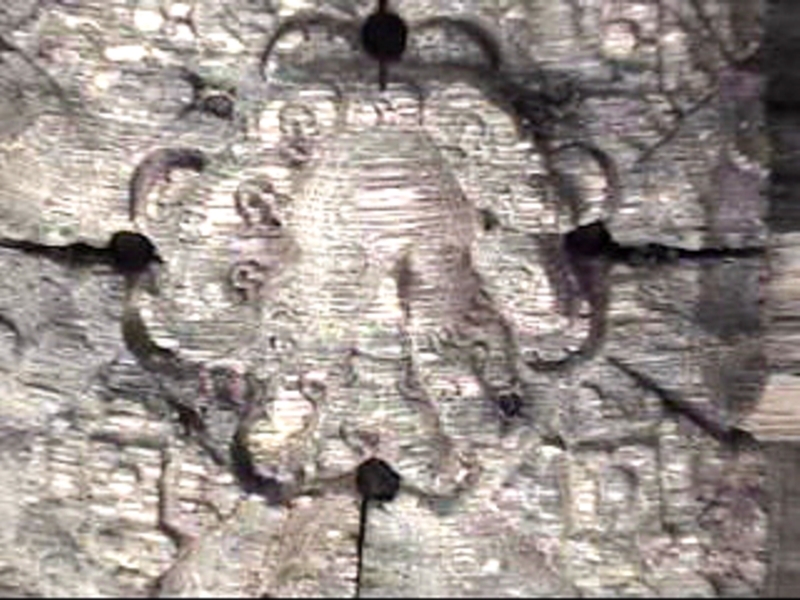 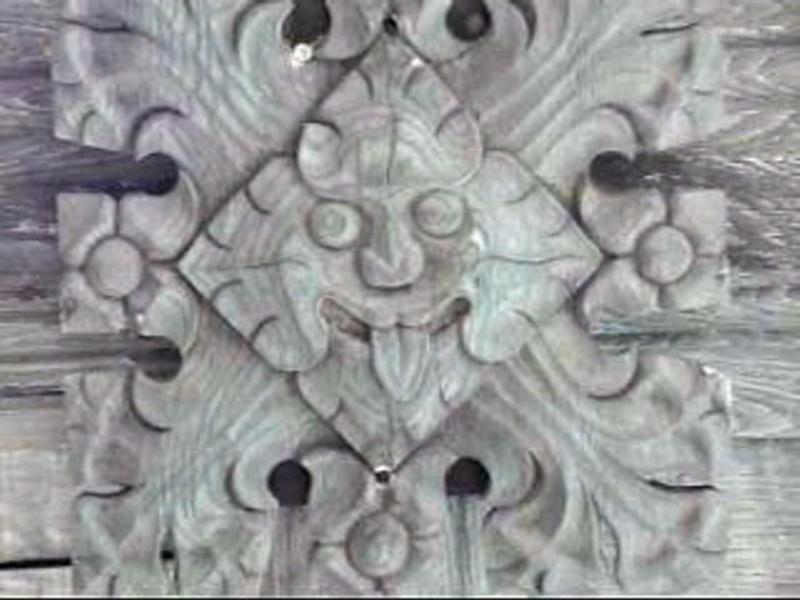 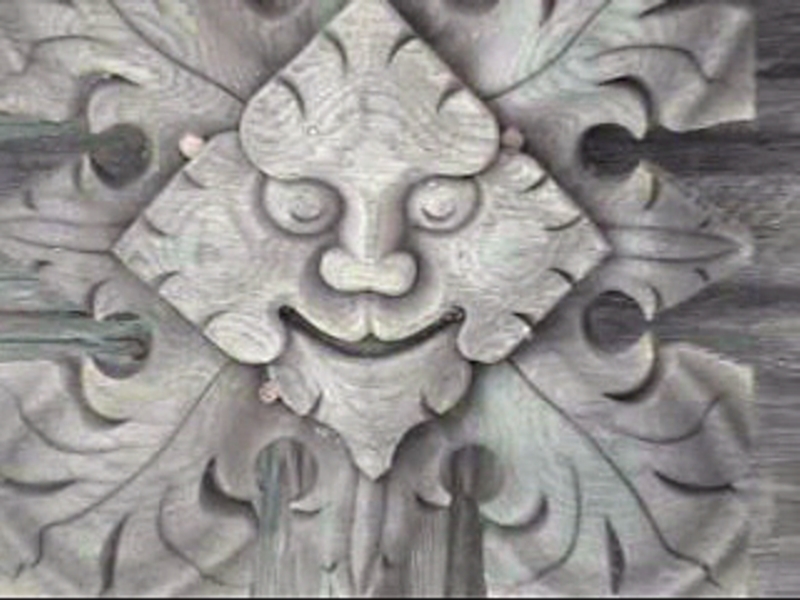 Although both these terms post-date 1939 when Lady Raglan first called such carvings after the 'Green Man' of folk custom, it is this latter term, and its variously associated and often fanciful ideologies (including Lady Raglan's assertion that he relates to the aforementioned green man of folk custom) that we appear to be stuck with. 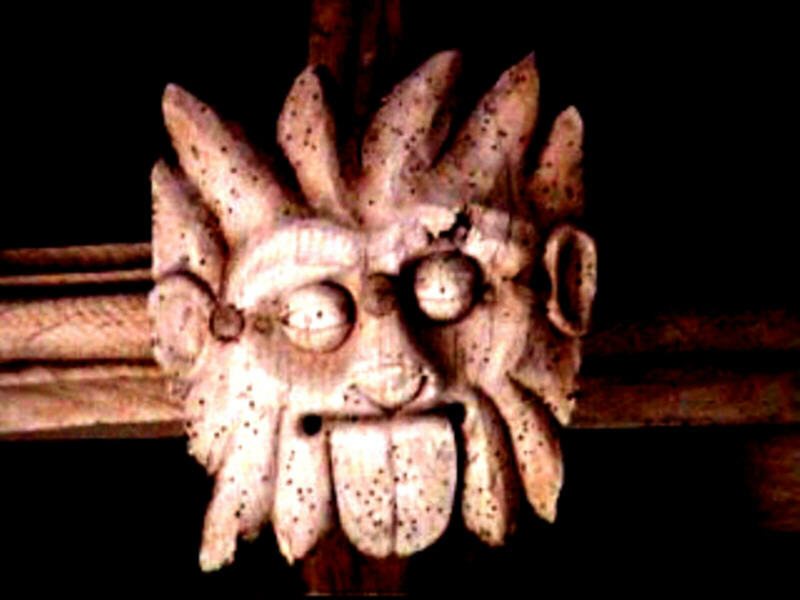 The 'paganisation' of folklore is the result of the self-same Victorian paternalism that justified the evils of colonialism. 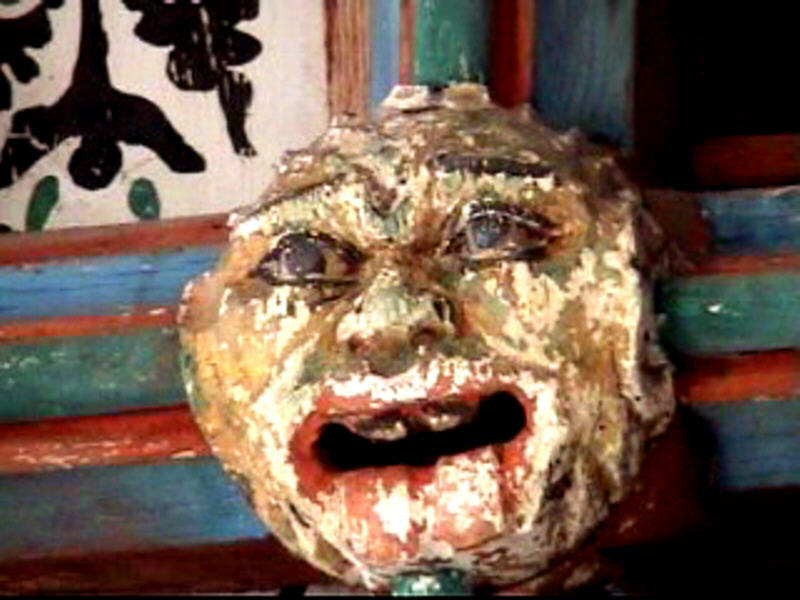 It's there in the cultural condescension that would interpret any given folk custom as being somehow vestigial of something now long forgotten. 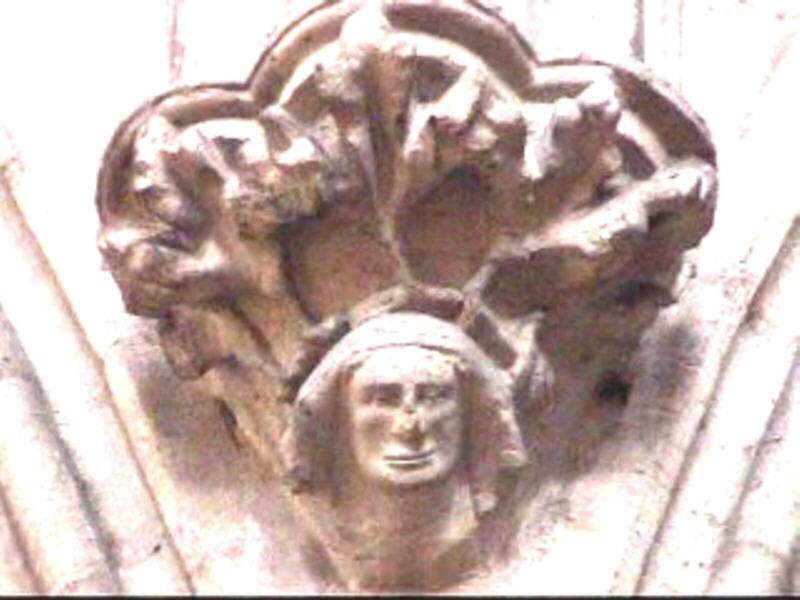 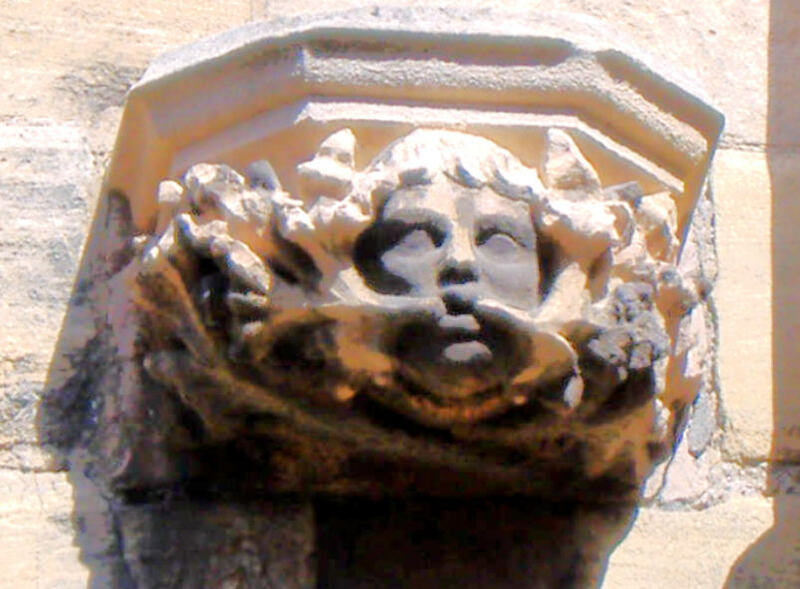 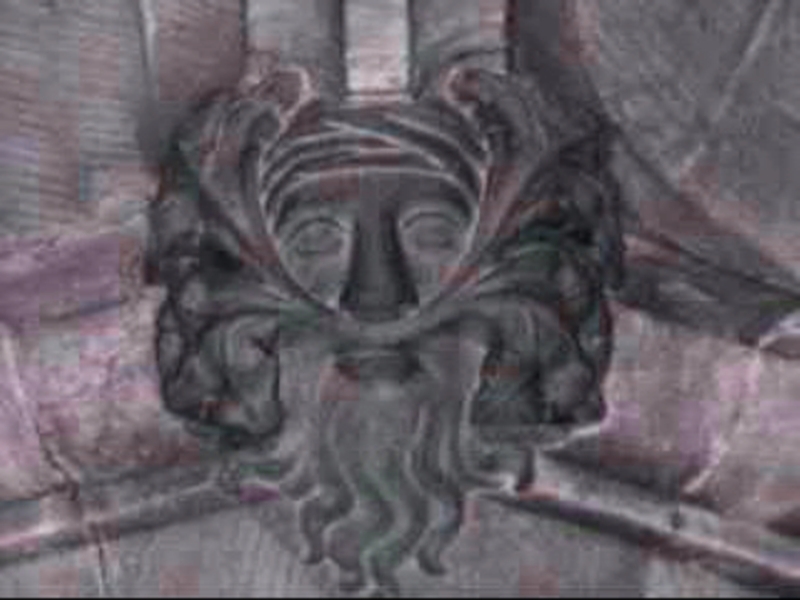 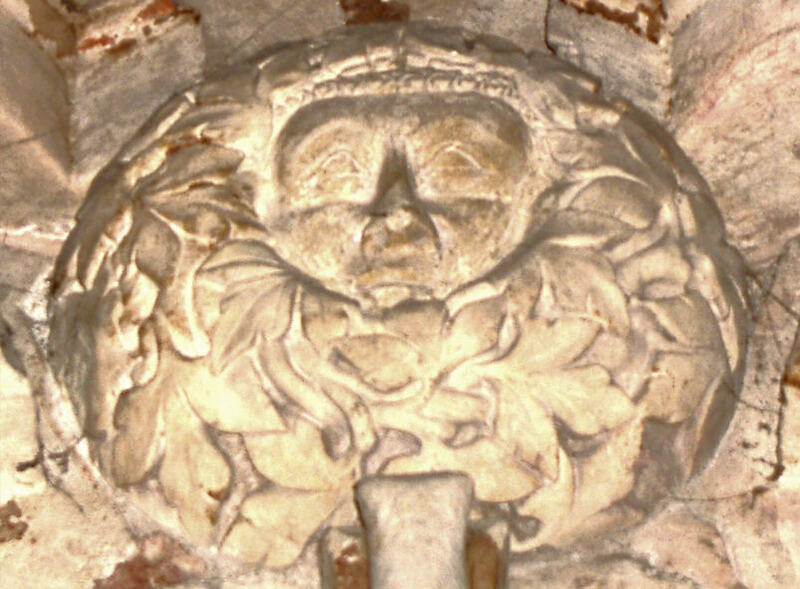 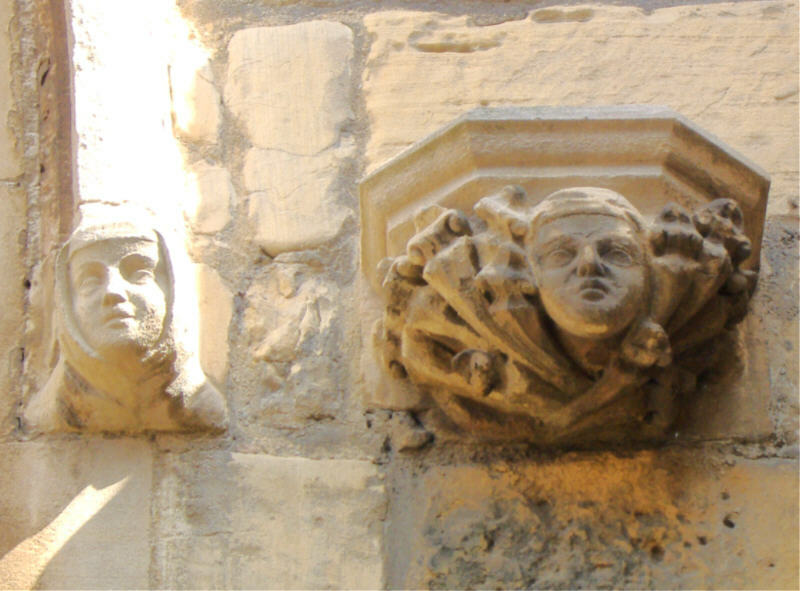 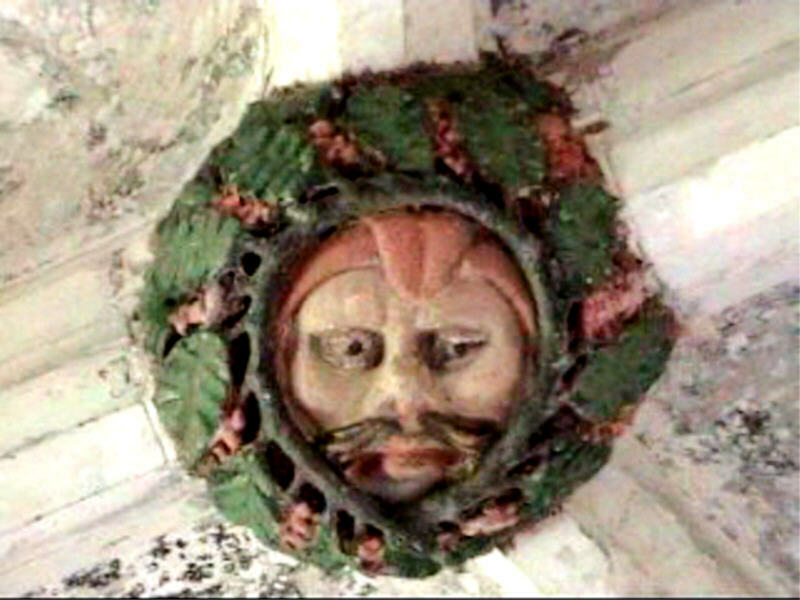 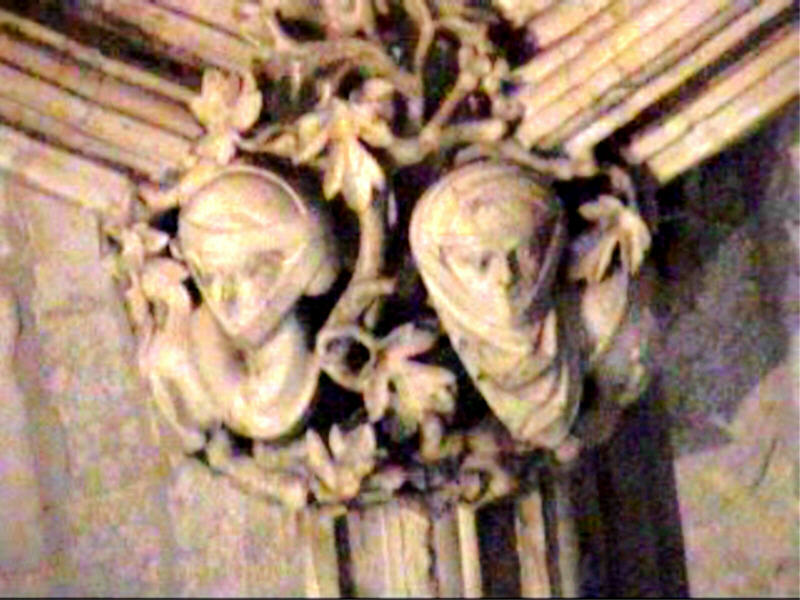 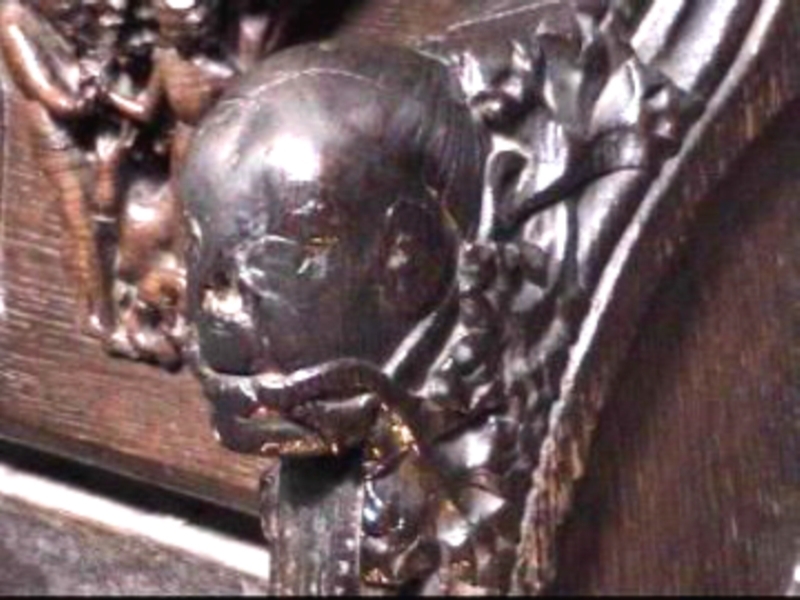 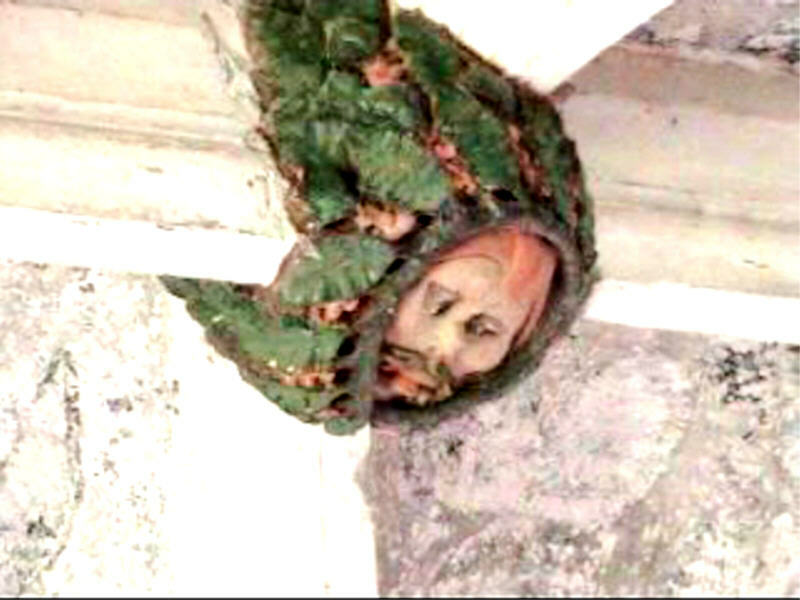 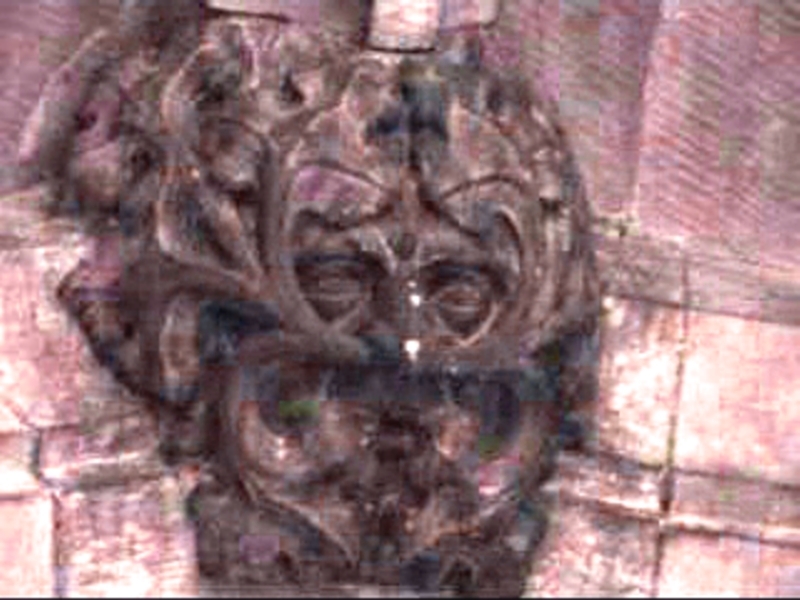 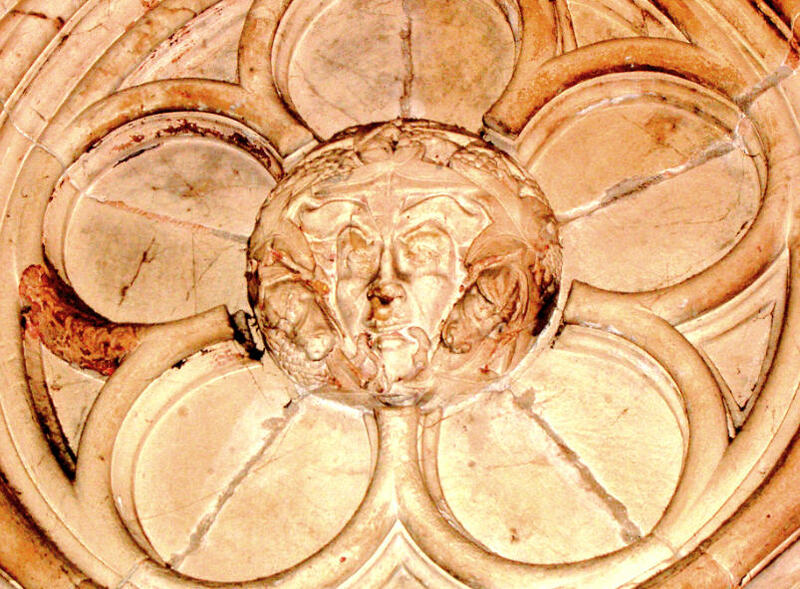 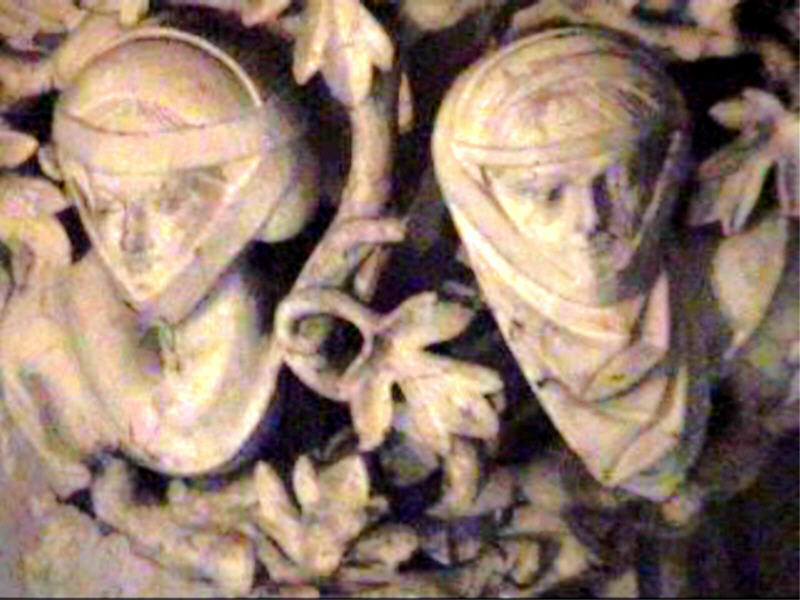 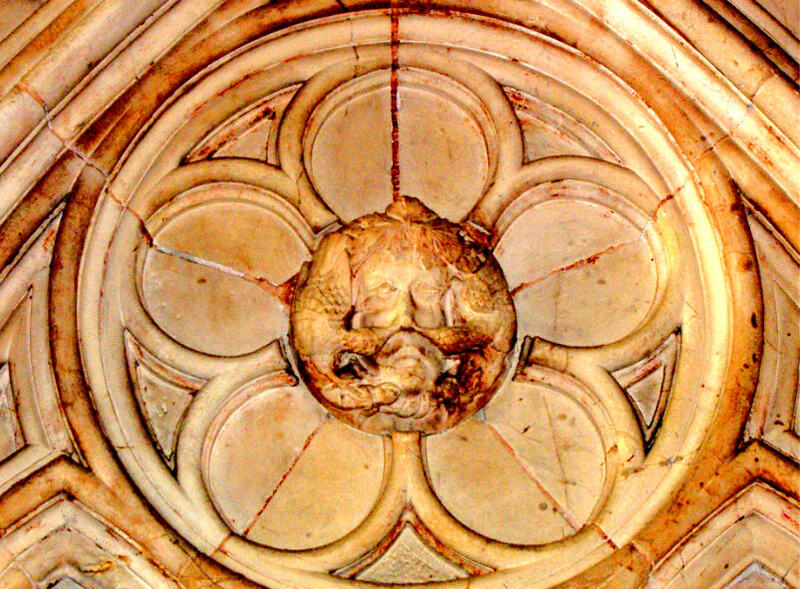 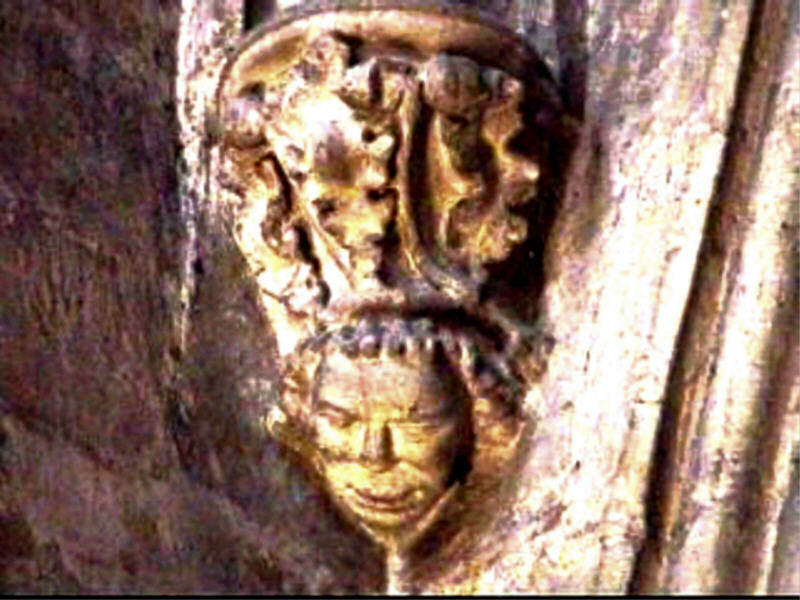 When the thoroughly aristocratic Lady Raglan first called her medieval ecclesiastical foliate head a 'Green Man', she did so fully in the faith that the Jacks-in-the-Green etc. 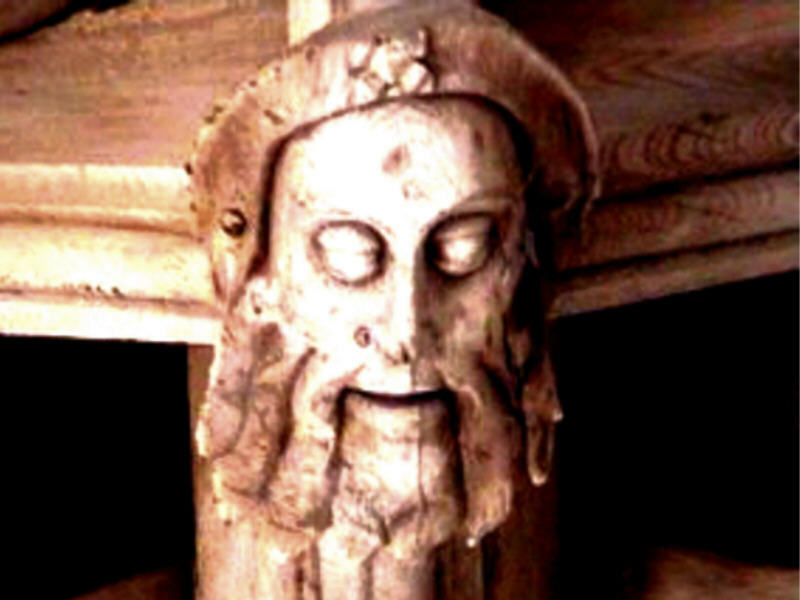 were survivals of pagan fertility rites quaintly perpetuated by an ignorant lower order of society unwittingly preserving as mere superstition an ancient belief system that they themselves couldn't possibly understand, either in terms of its 'true' provenance or else its 'real' meaning. 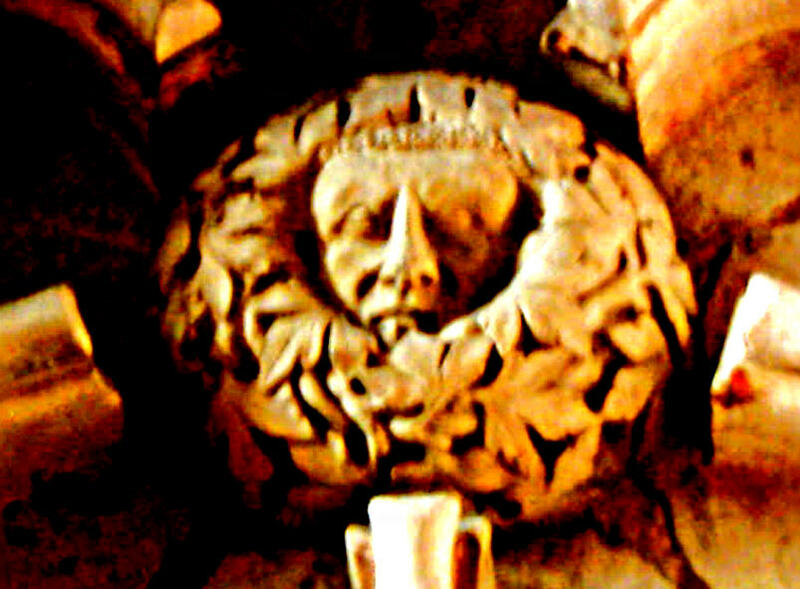 That such thinking still exists today tell us much about the political & cultural agendas of modern pagans and such-like new-agers who think themselves privy to a deeper sacred knowledge, such as the increasingly queer notions one finds in most books on the Green Man which masquerades as ancient wisdom but is in actual fact wholesale, and unfounded, invention on the part of the writers. 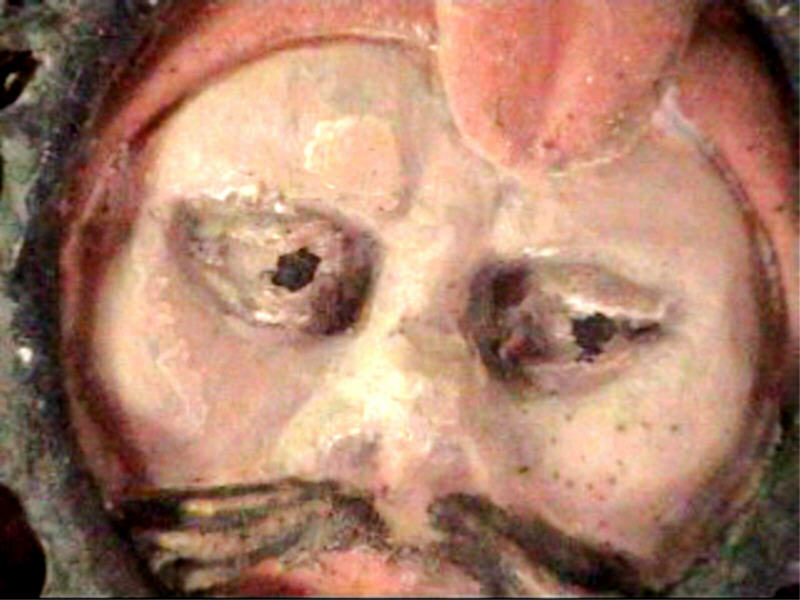 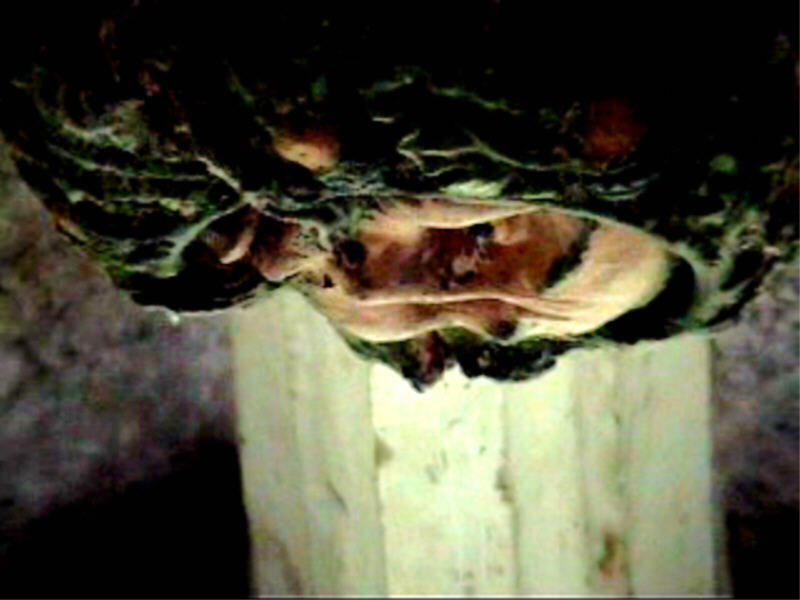 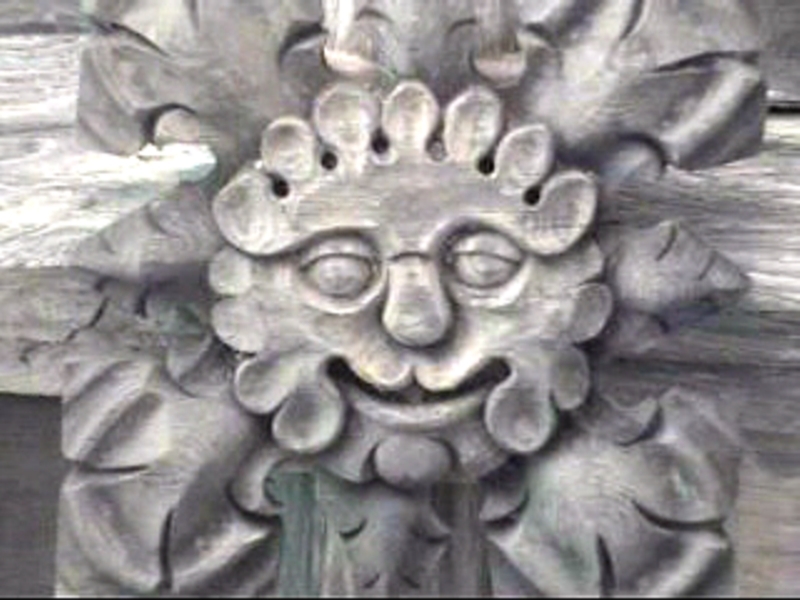 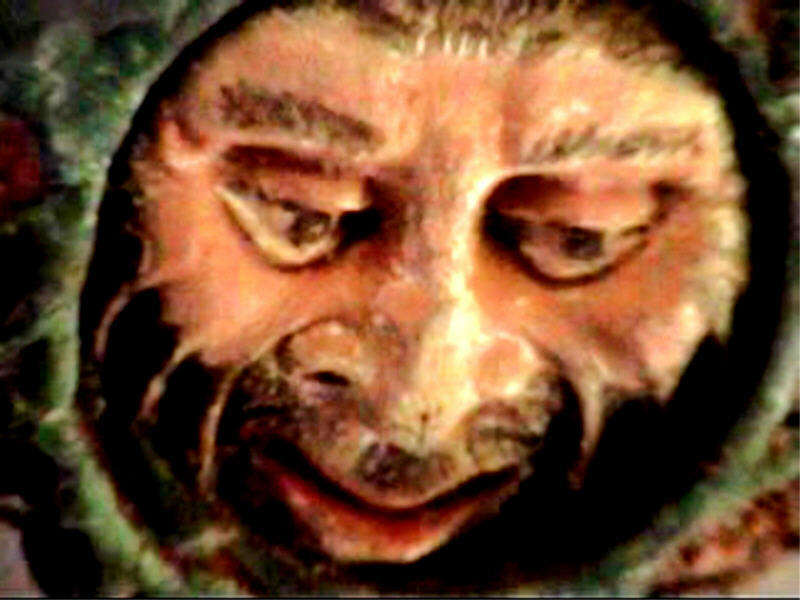 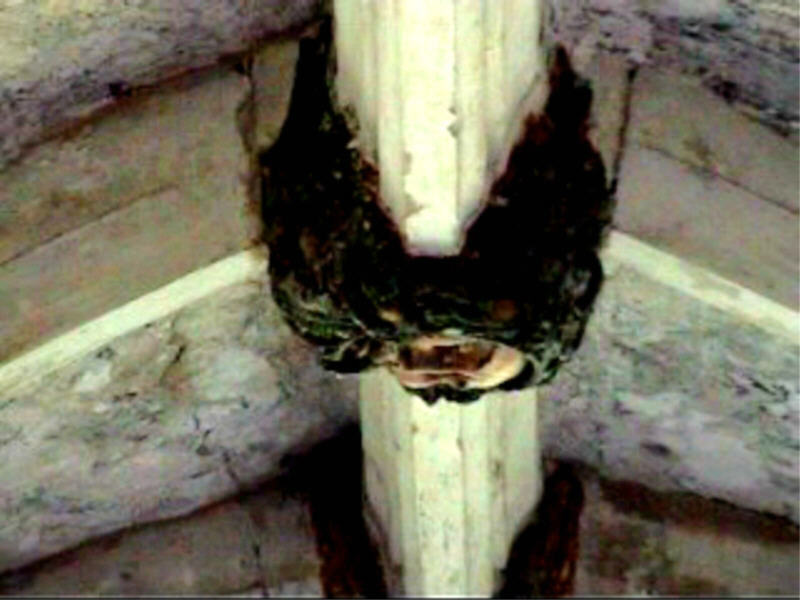 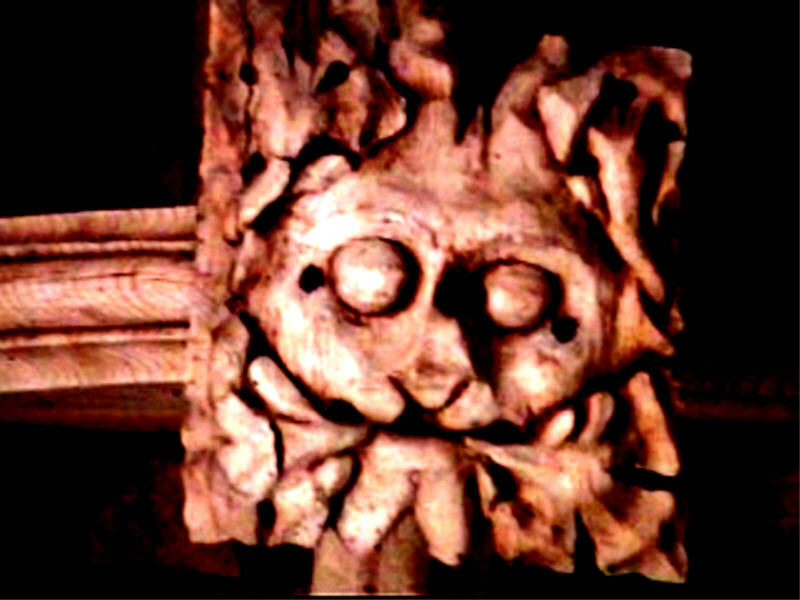 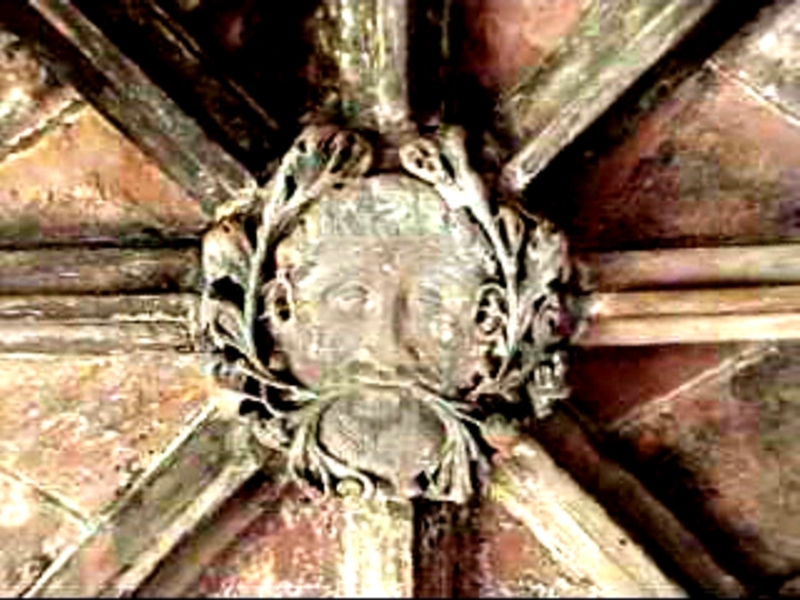 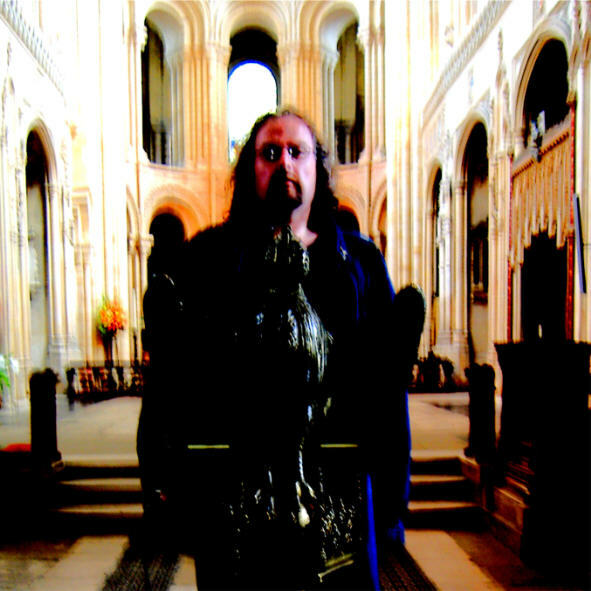 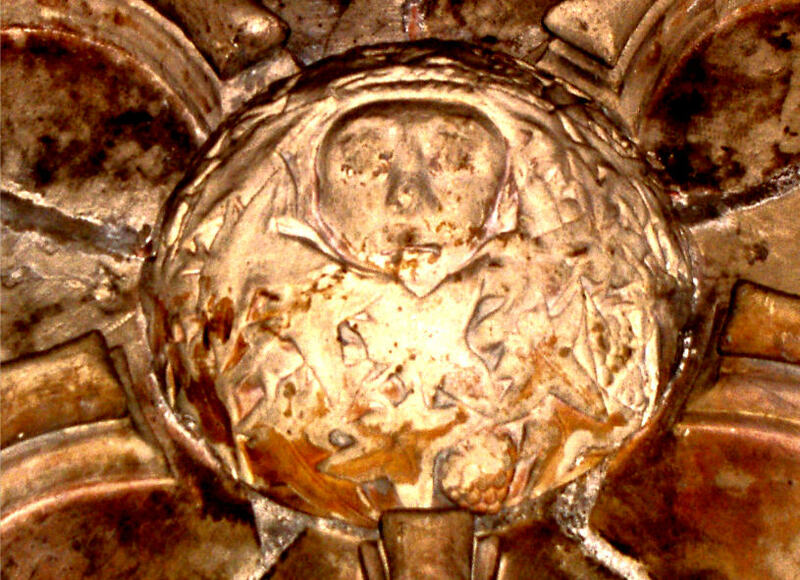 The assumption that the Green Man somehow derives from a non-Christian / pagan prototype (and is therefore entirely anomalous in an ecclesiastical context) has become as deeply entrenched in the popular imagination as the belief that the nursery rhyme 'Ring-a-Roses' is a reportage on the symptoms of the Black Death. 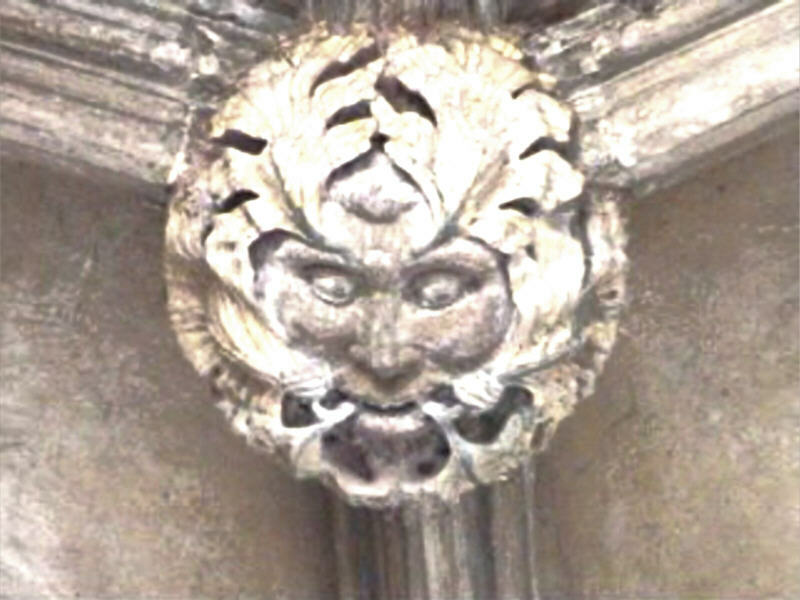 Given the sheer and quite deliberate diversity of 'green men' on offer, it is perhaps surprising that 'he' is seen to be representative of a single 'figure' (or indeed 'archetype') at all. 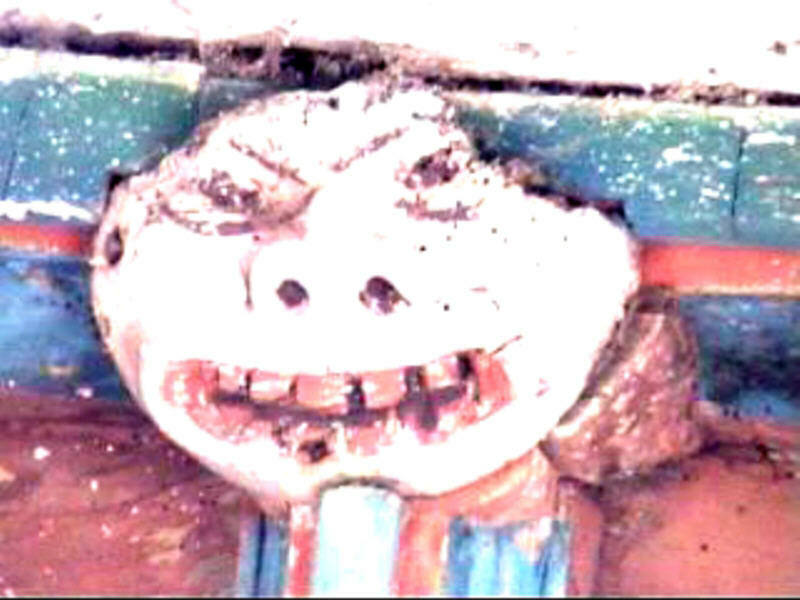 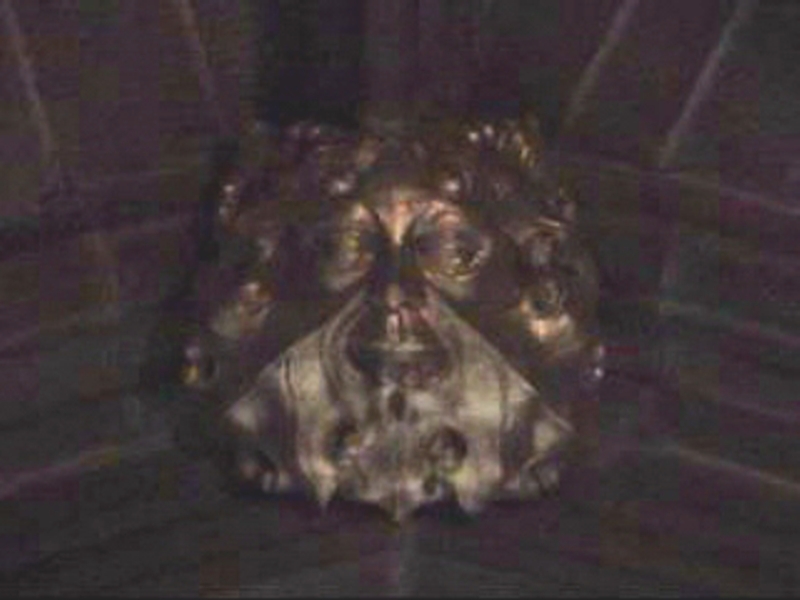 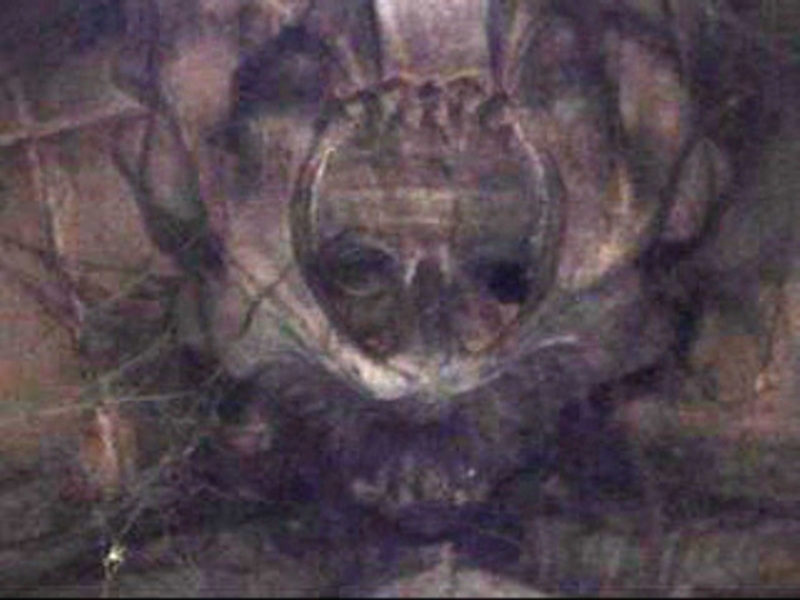 It seems far more likely that they are a graphic depiction of the condition most fundamental to human existence (and indeed most central to the religion that is their sole context), for, aside from the cat-heads and such-like 'babewyns', it is Everyman we see depicted here, be it in rustic caricature or else exquisite portrait. 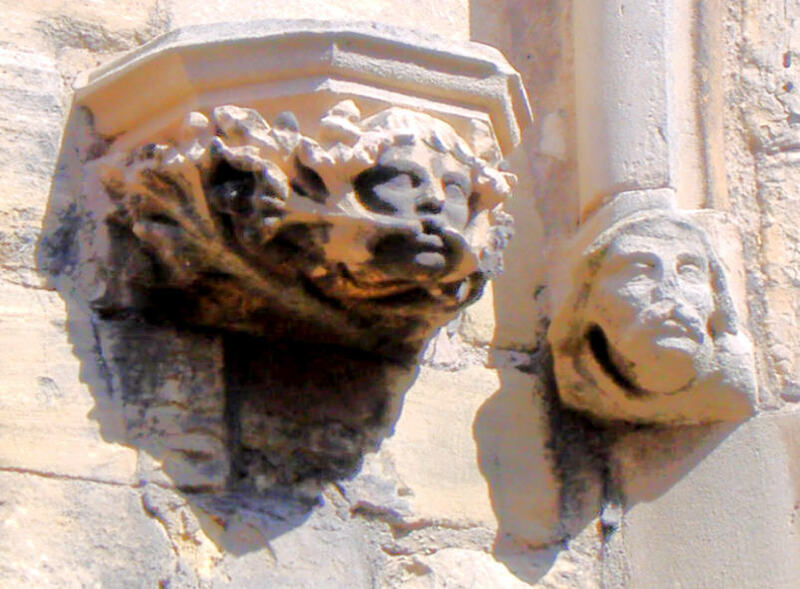 No jolly Jacks-in-the-Green these; for what we see here are ourselves, being afflicted, tortured, invaded and otherwise tormented by nature at its most rampantly malevolent. 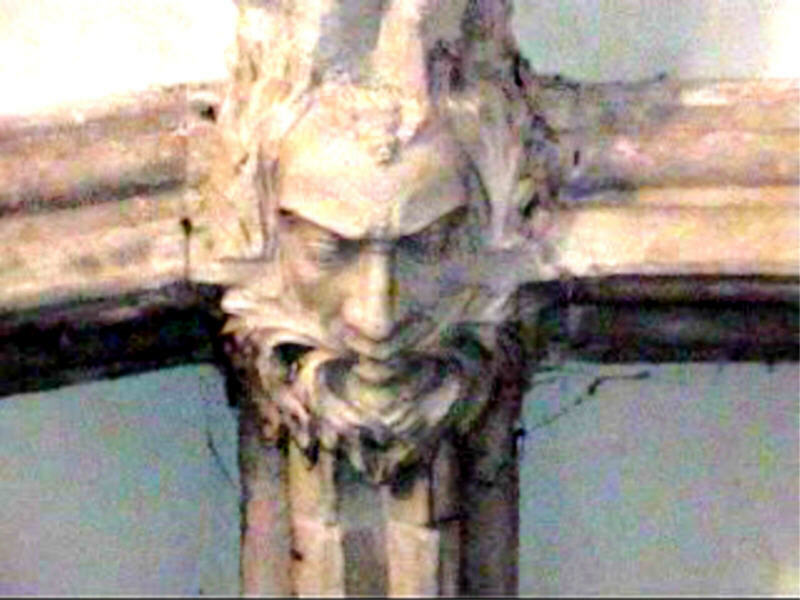 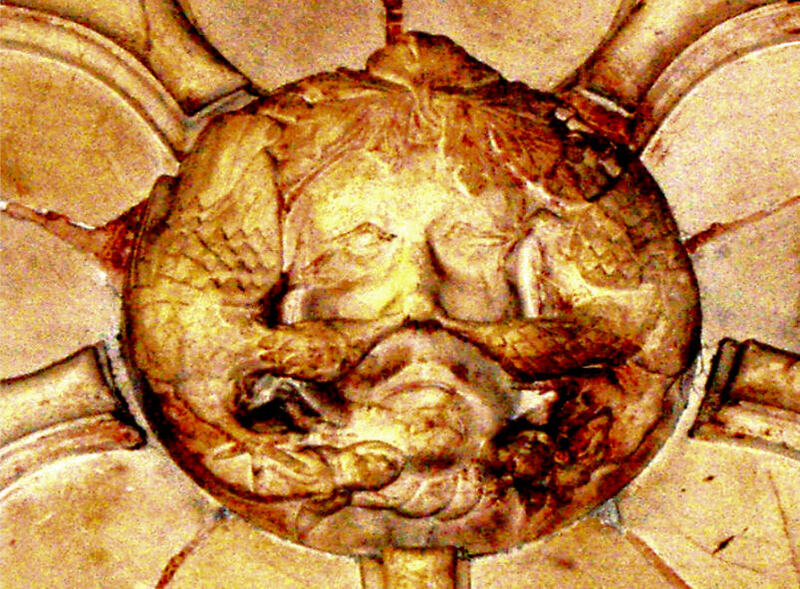 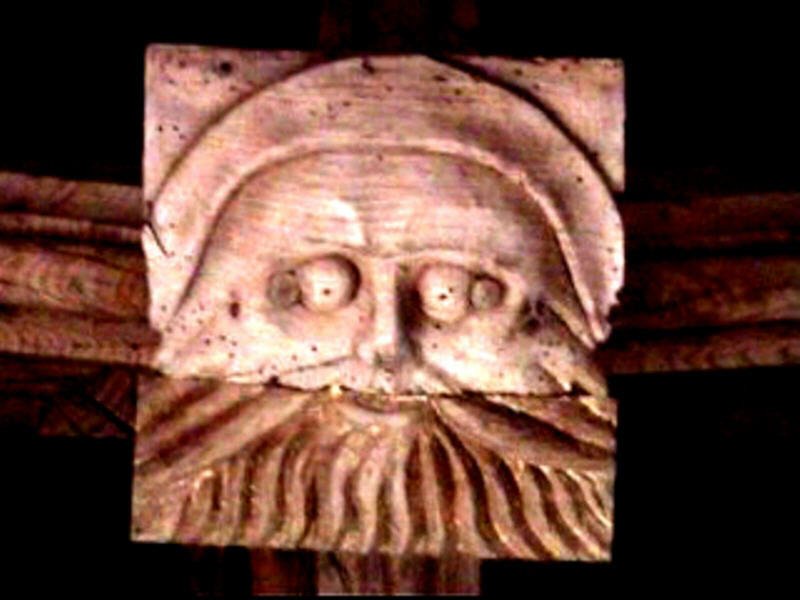 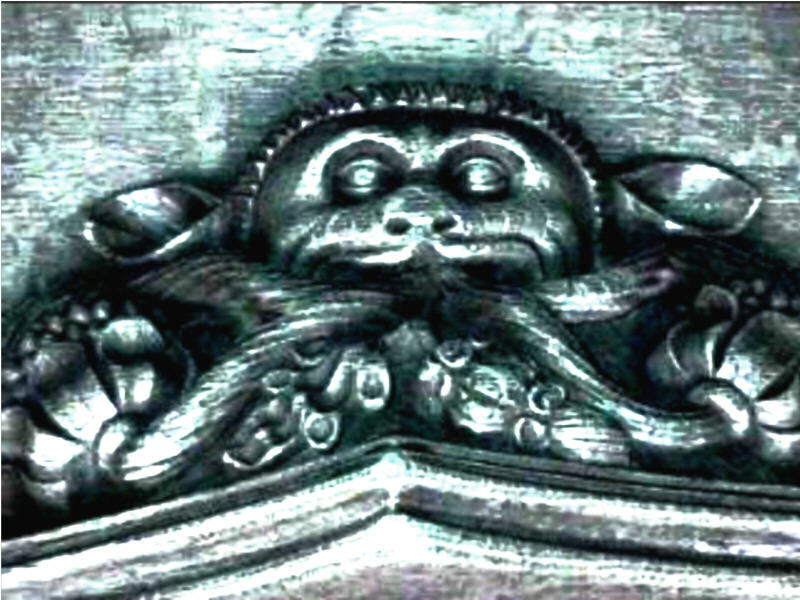 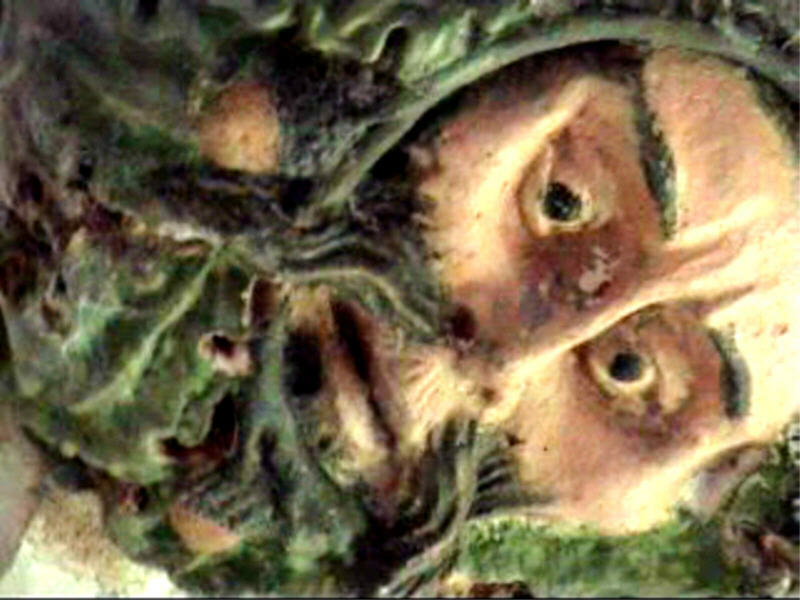 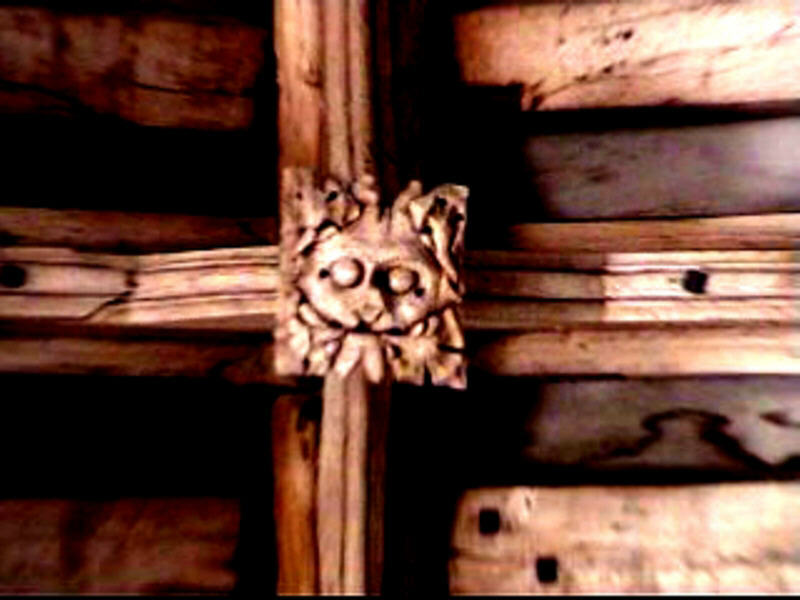 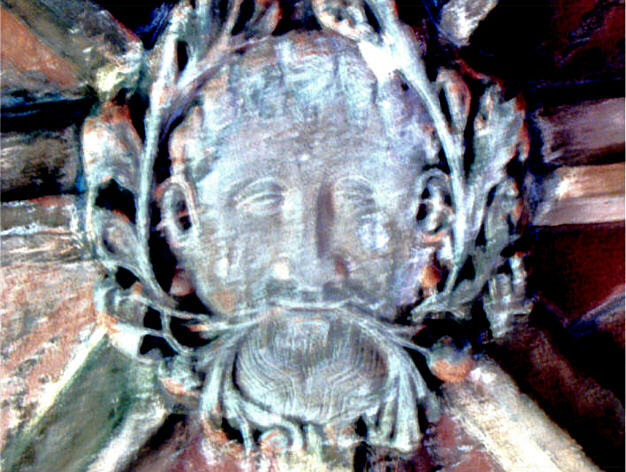 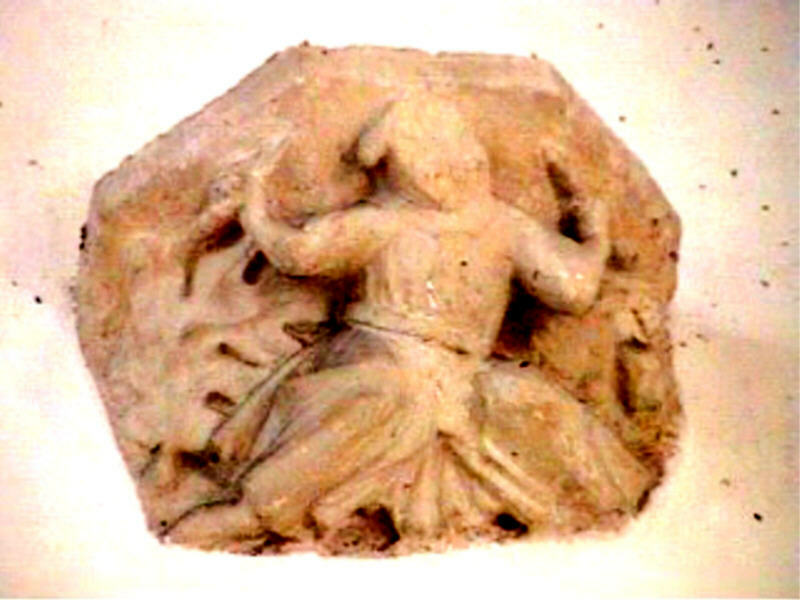 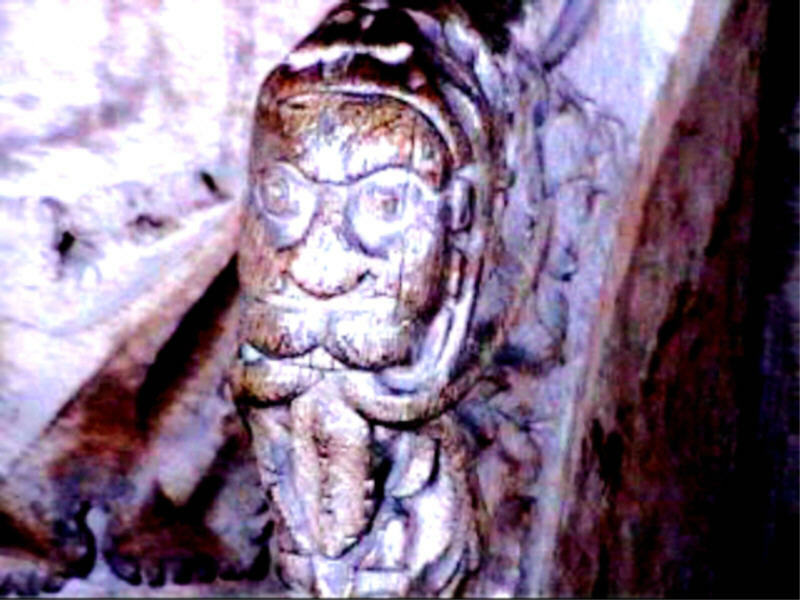 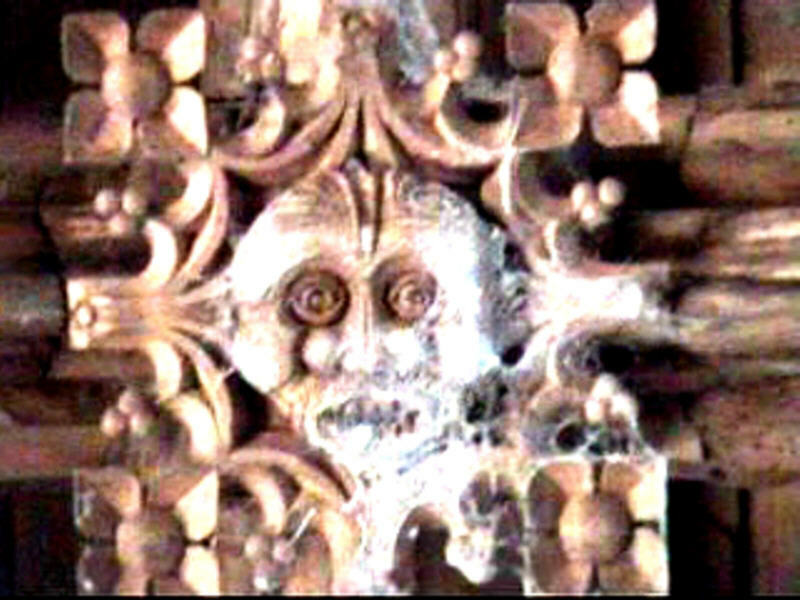 Whilst both modern-day Christians and Pagans might well balk at such a notion, pointing as precedent to the many undoubted pagan elements in almost every aspect of Christian theology, mythology, iconography and usage, it would seem ironic that the Green Man would appear to have no clear pagan prototype whatsoever, and is therefore (with the exception of a few murky, at best, Classical and non-Western analogues) an entirely Christian invention totally in keeping with the cultural and theological context of Pre-Reformation Medieval Catholicism in which they are found in their countless thousands. 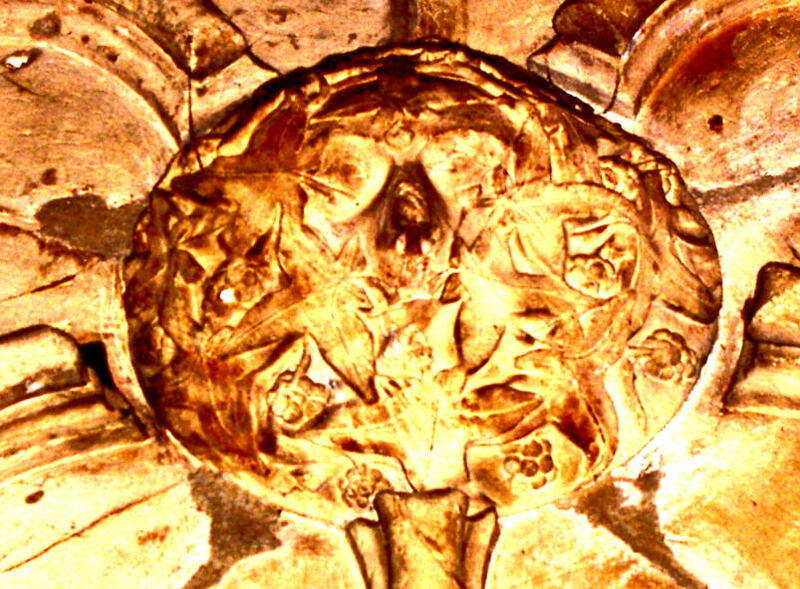 However, whatever one chooses to believe (or for that matter disbelieve), and whatever name one may choose to call him by, one would hope the overriding feeling is that the 'Heads-with-Leaves' remain a subject worthy of sensible debate, discussion, investigation and interpretation; hence this page, which I offer as my personal contribution to the understanding, appreciation and indeed celebration of the Foliate Grotesque otherwise known as the Green Man. 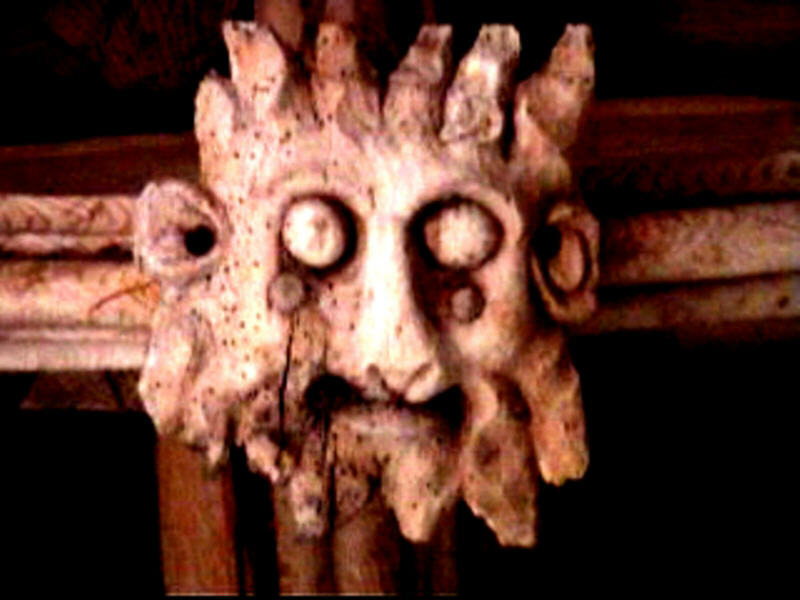 On a technical note, all these images were made using a Sony Handycam digital video camera, so what you see are stills edited from movies (some of which are included below); and whilst the Handycam does allow for still shots to be taken, these are most definitely 'images' (which have no corporeal copy) as oppose to 'photographs' (which most definitely do). 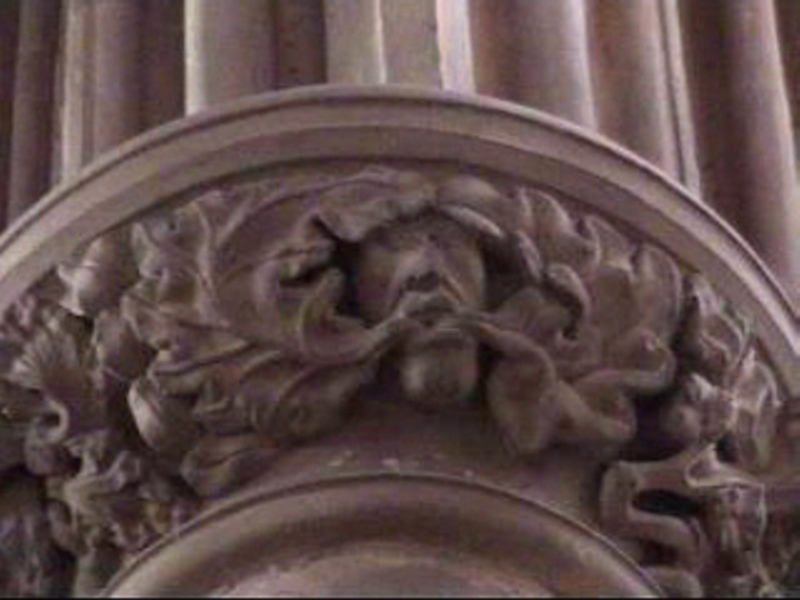 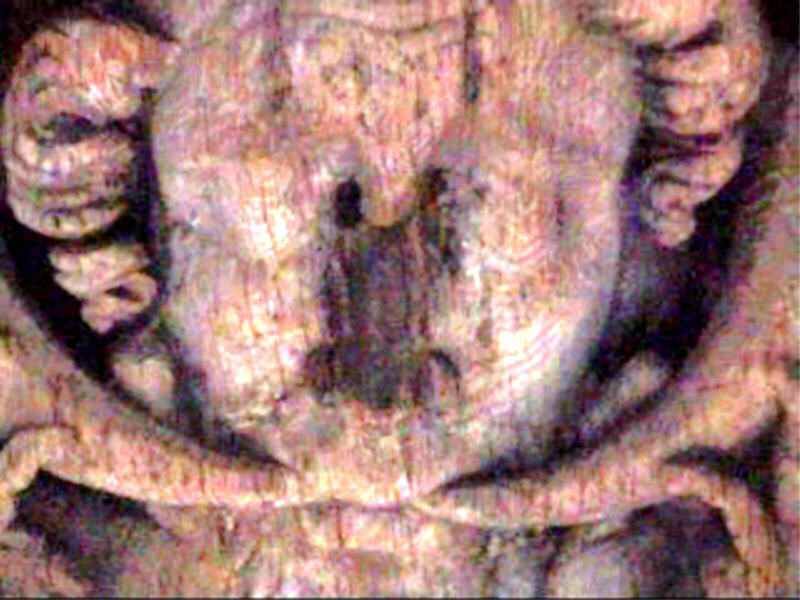 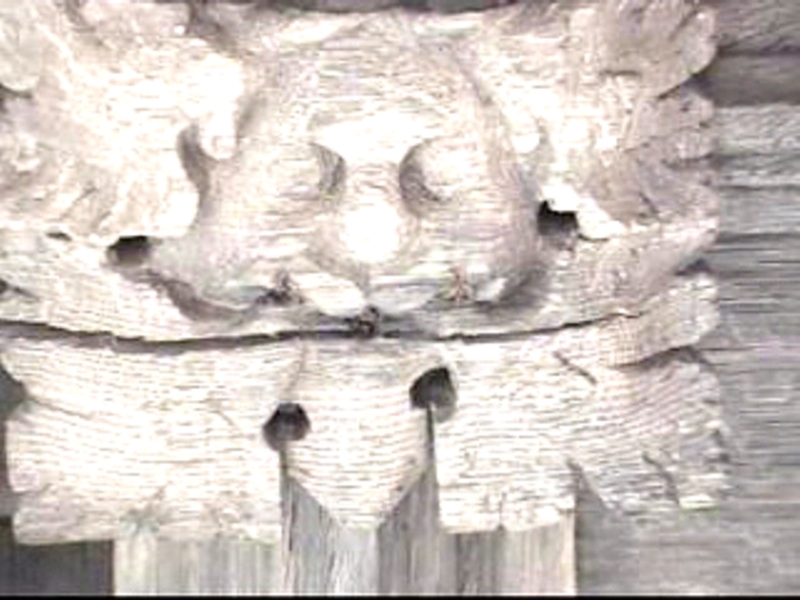 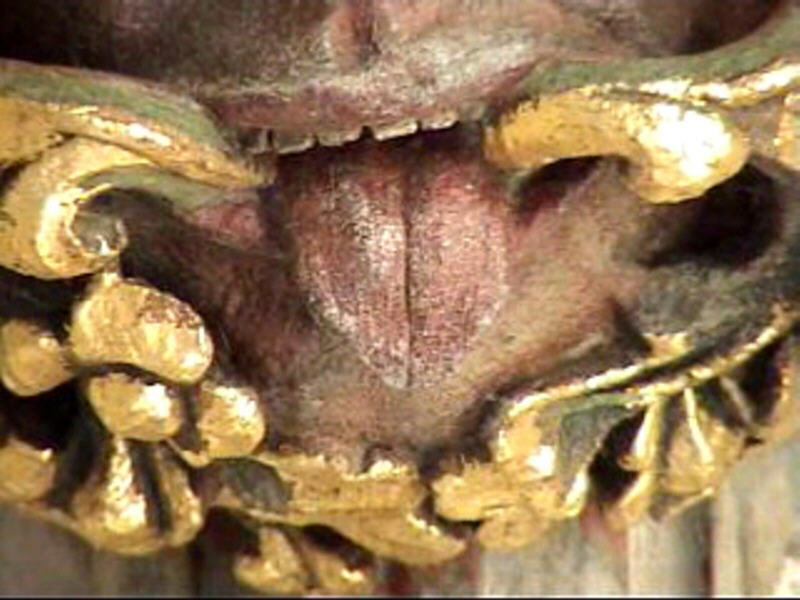 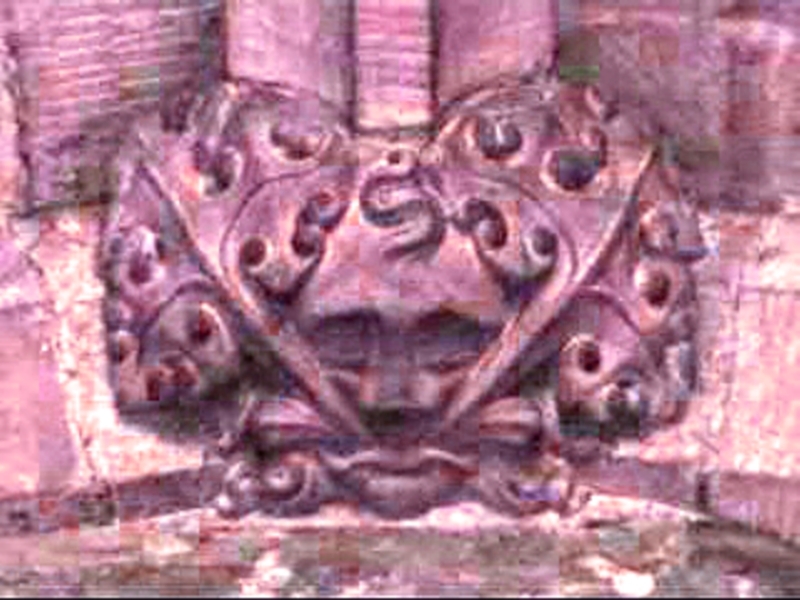 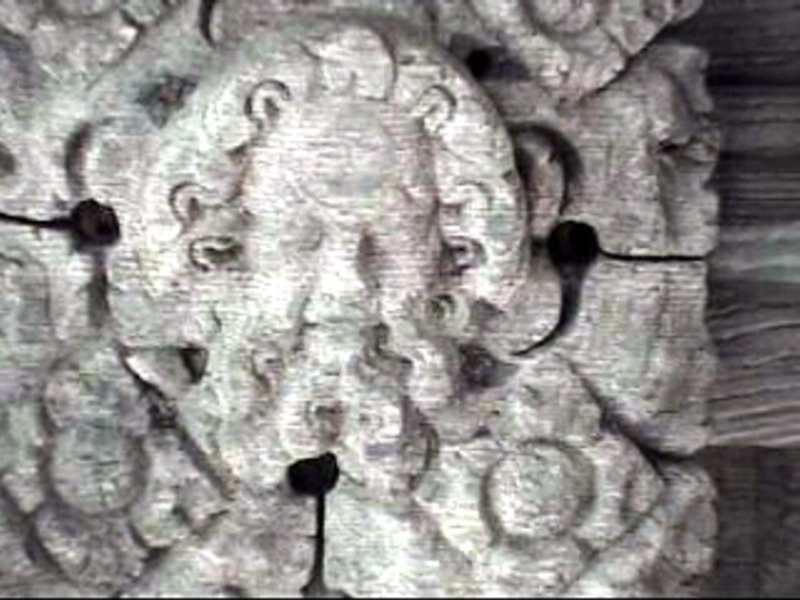 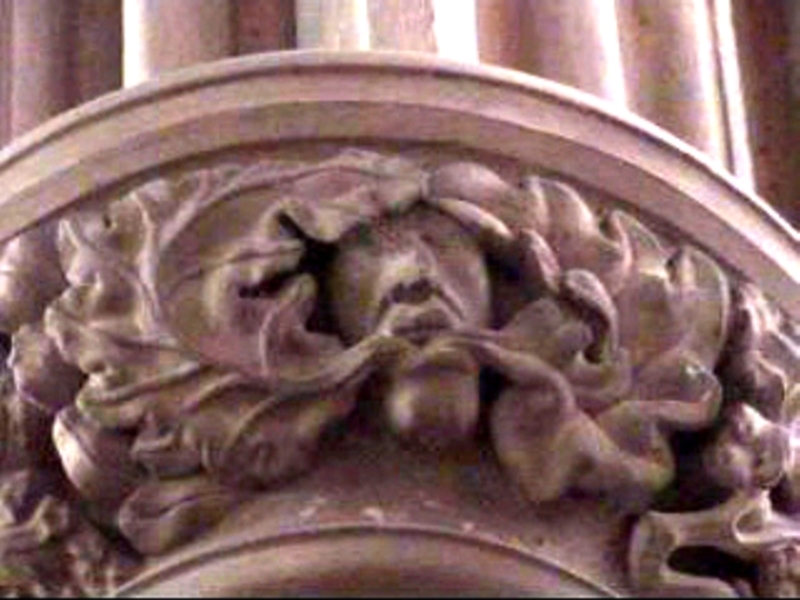 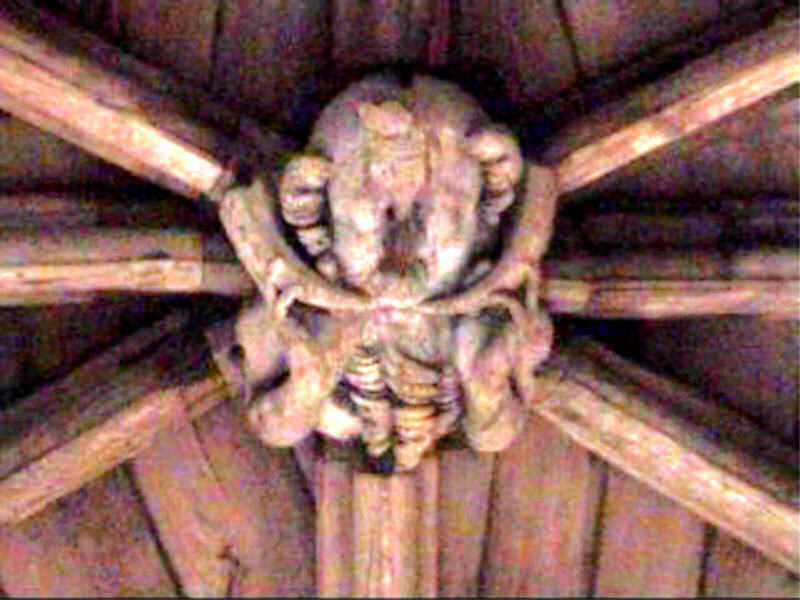 The zoom facility makes it an ideal tool in the search for and capture of the various boss vignettes & grotesques that are very often too high up to be made out with the naked eye; even those which are close-to can be examined in all their exquisite detail. 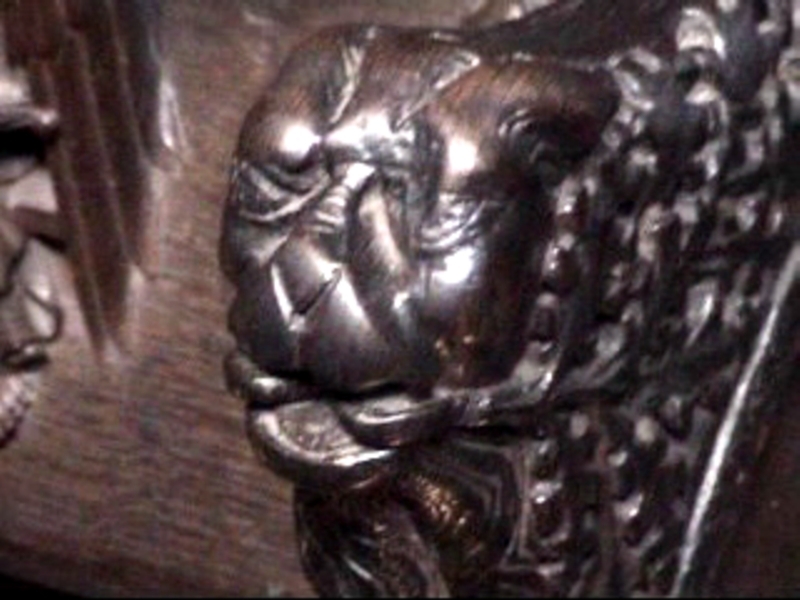 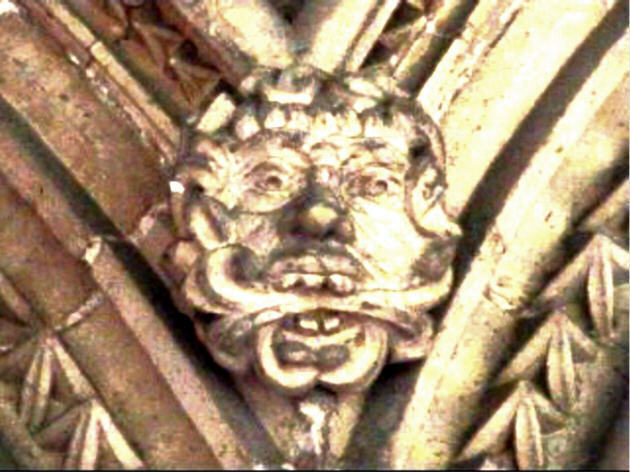 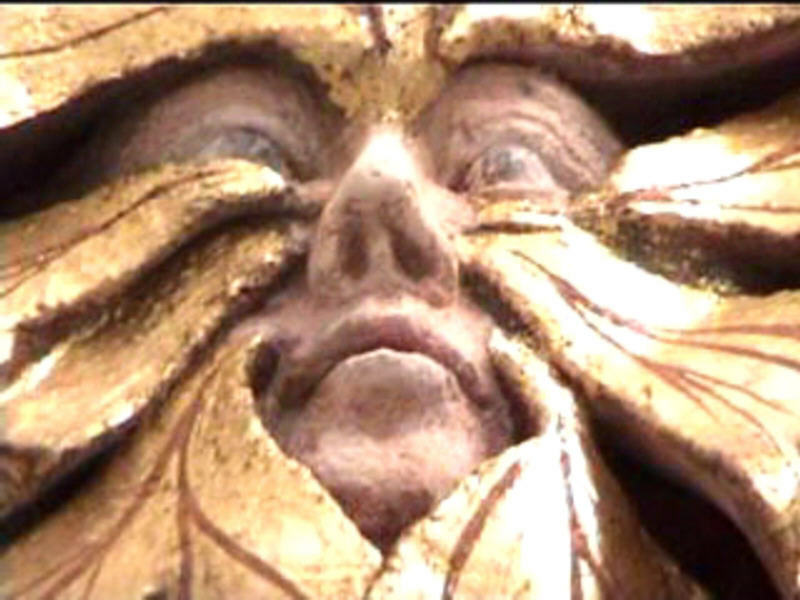 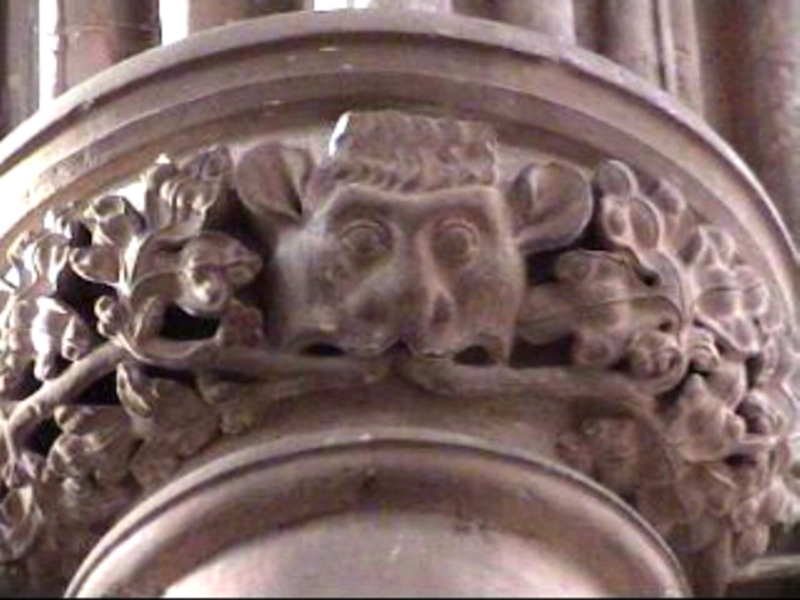 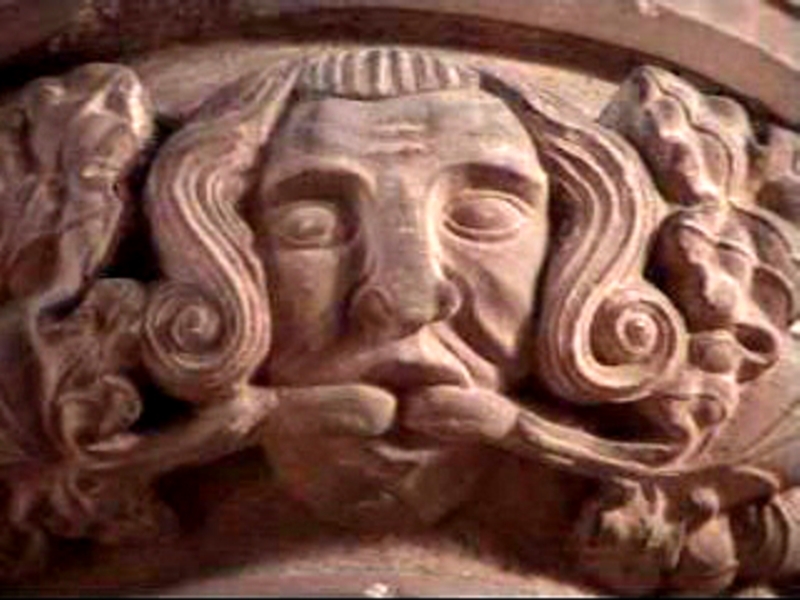 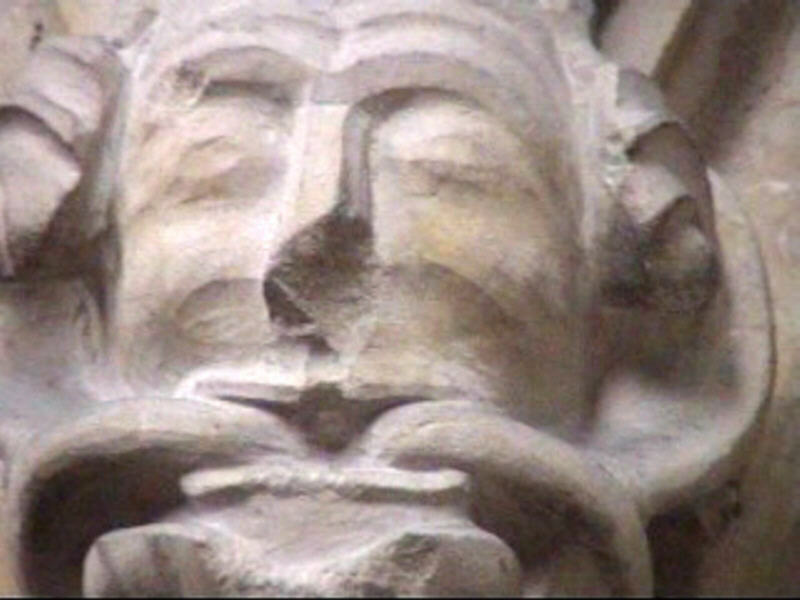 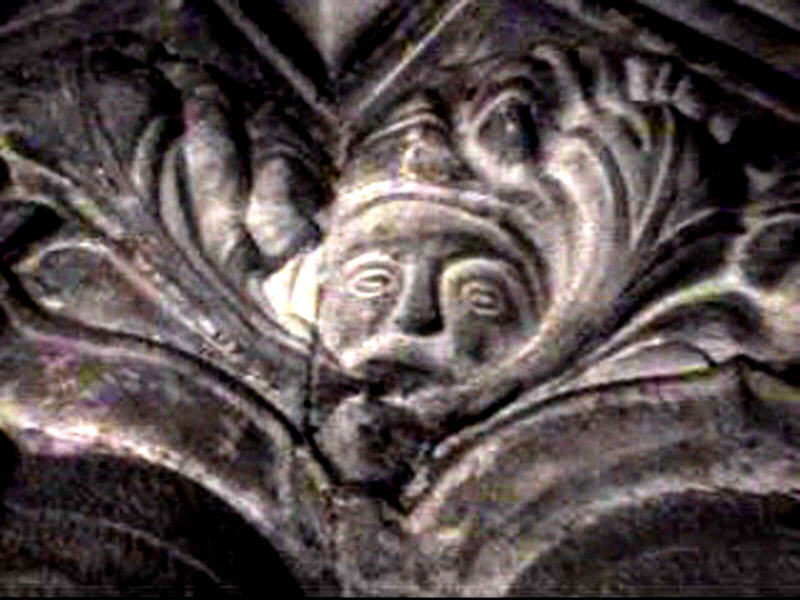 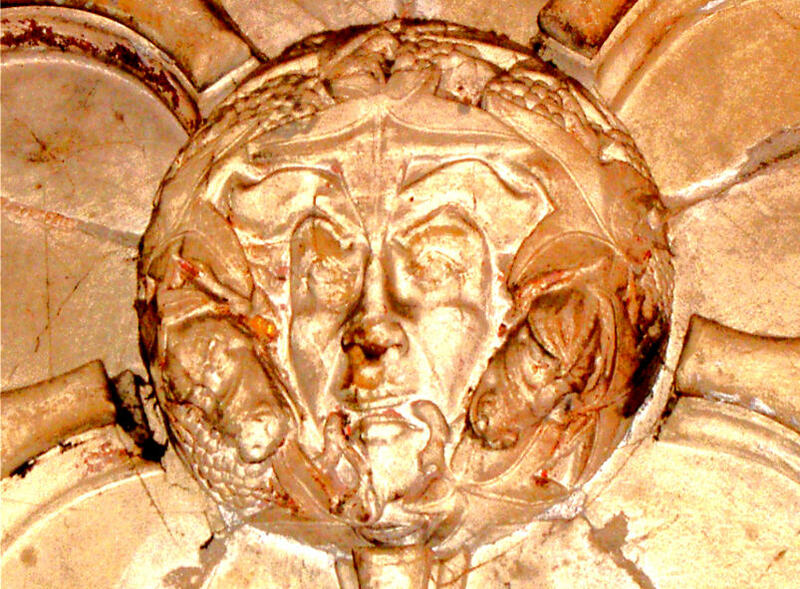 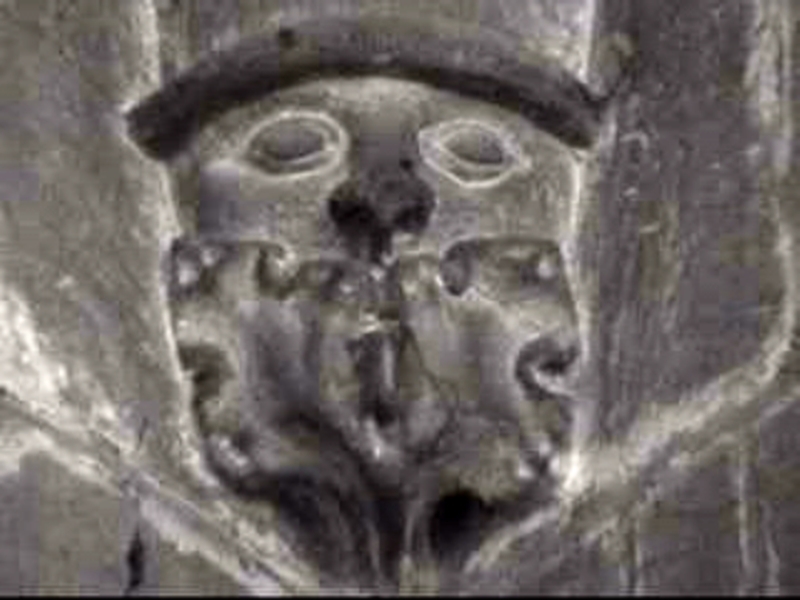 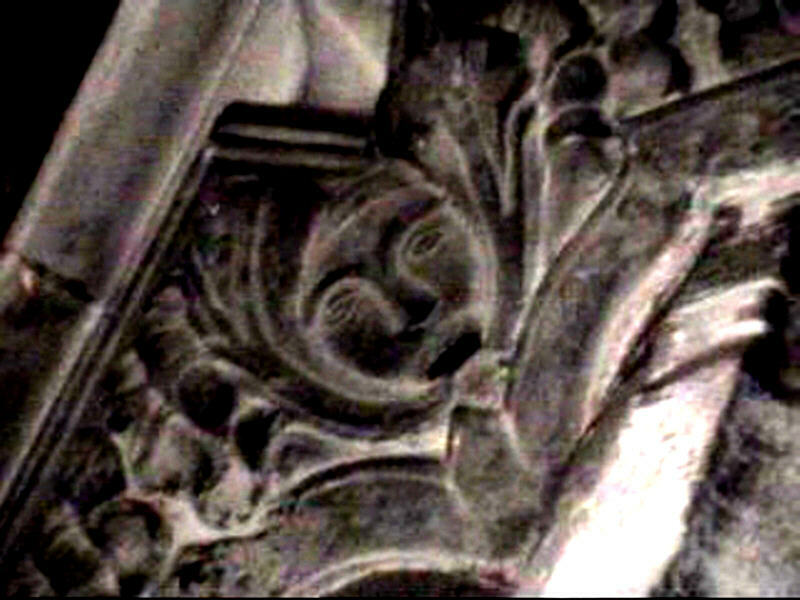 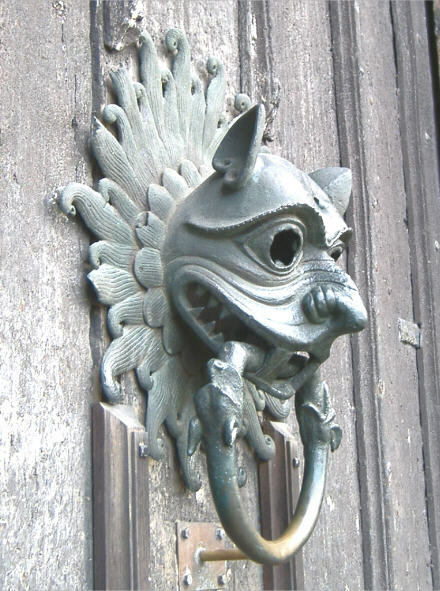 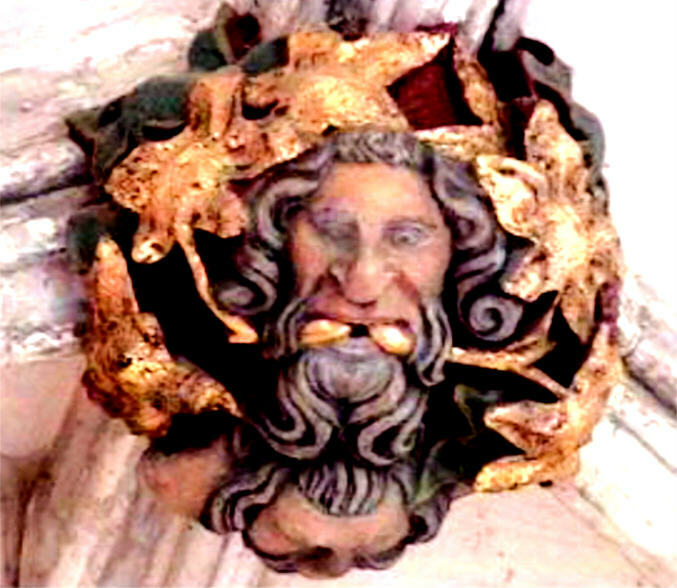 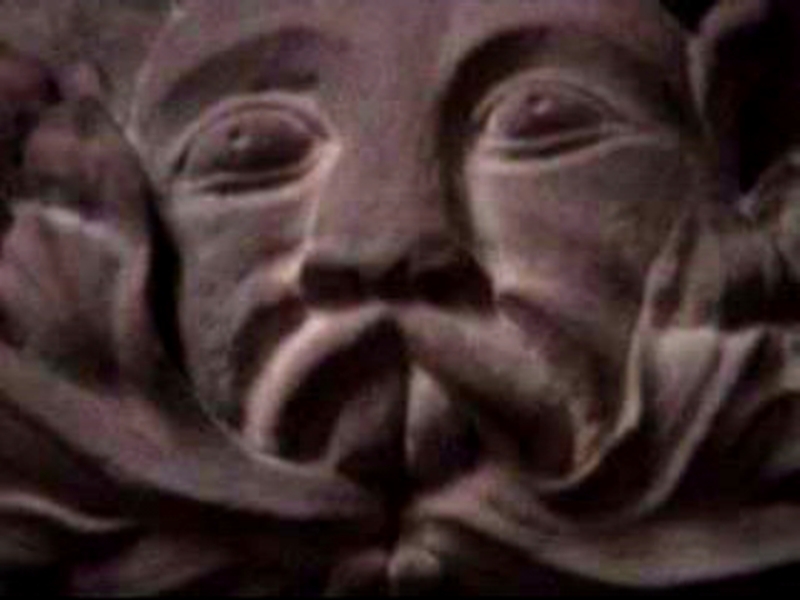 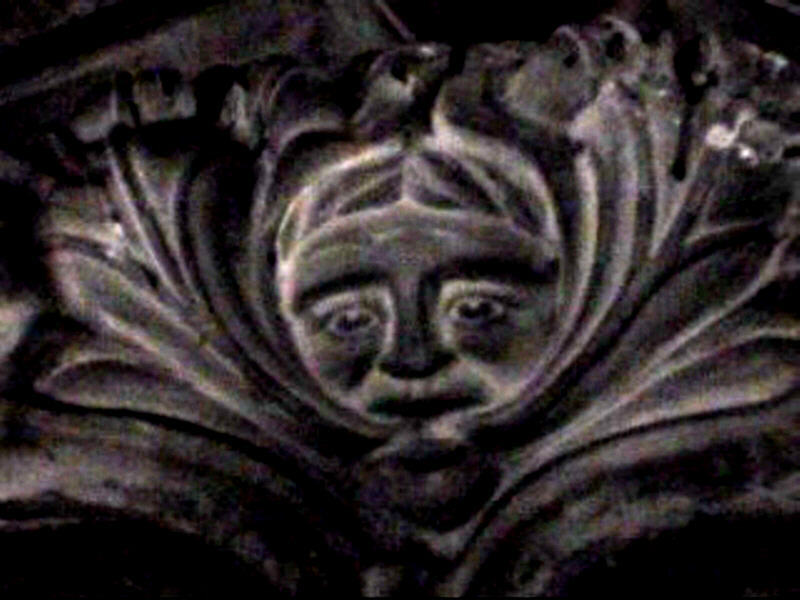 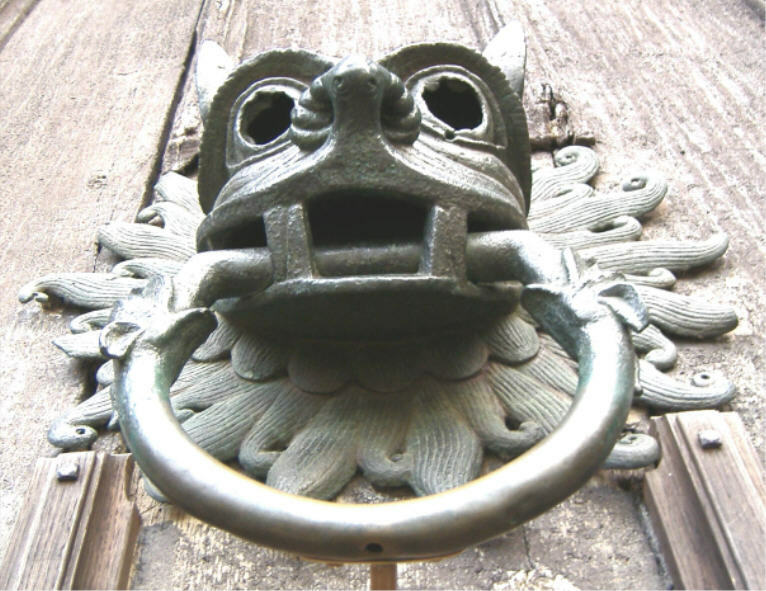 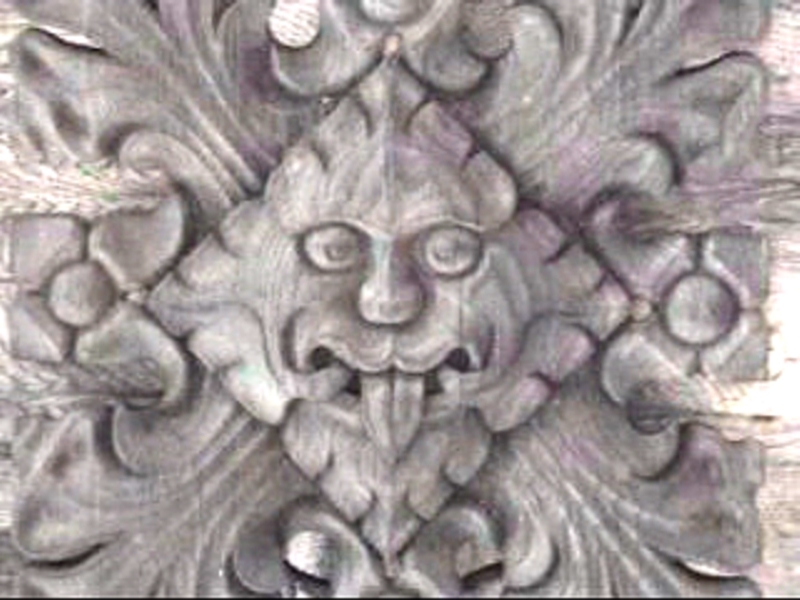 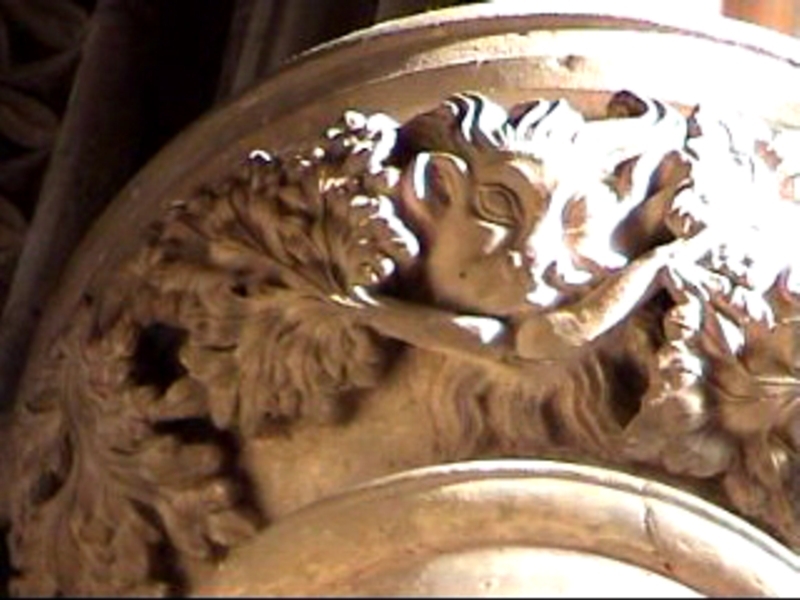 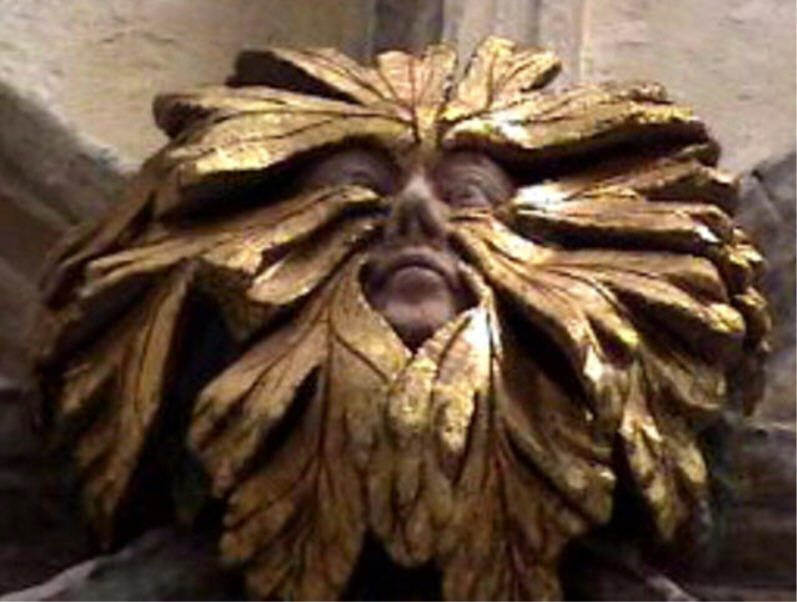 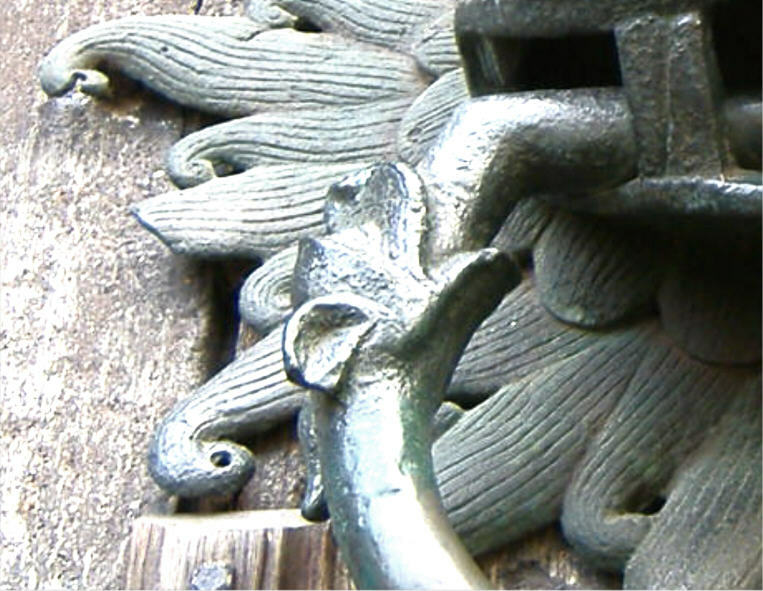 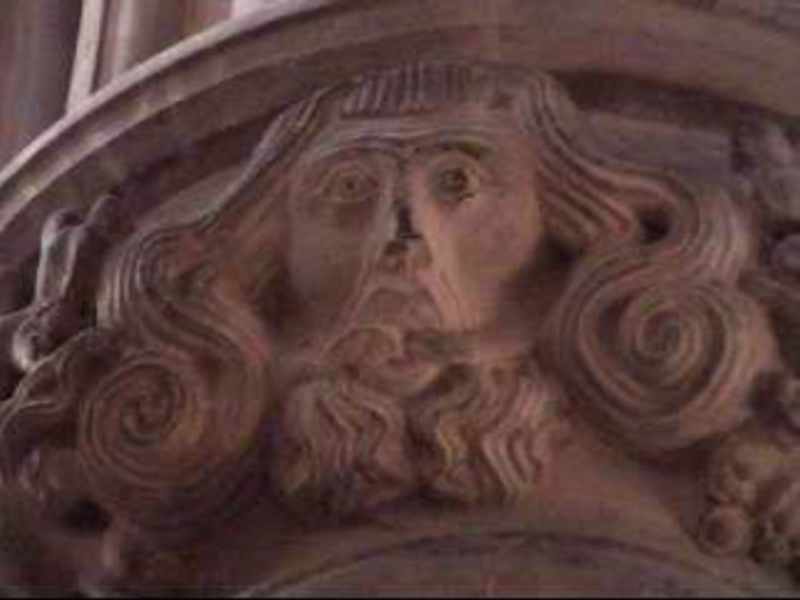 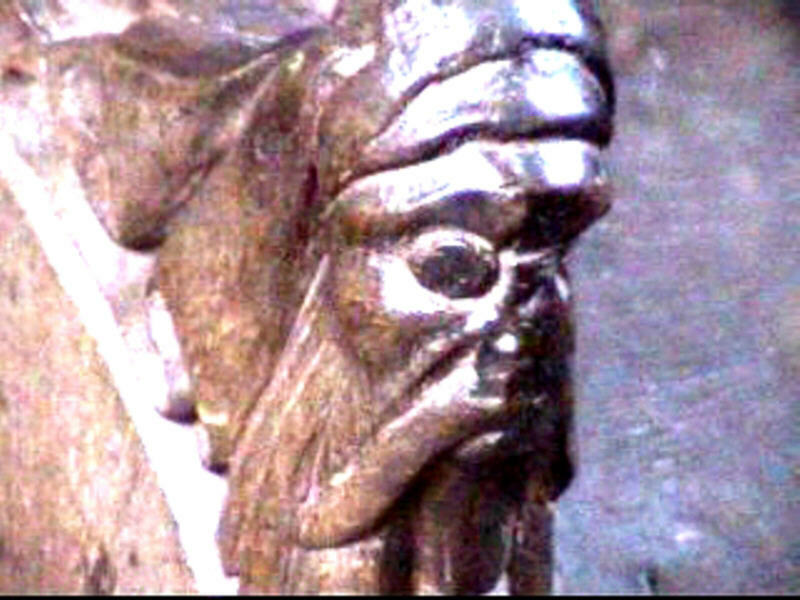 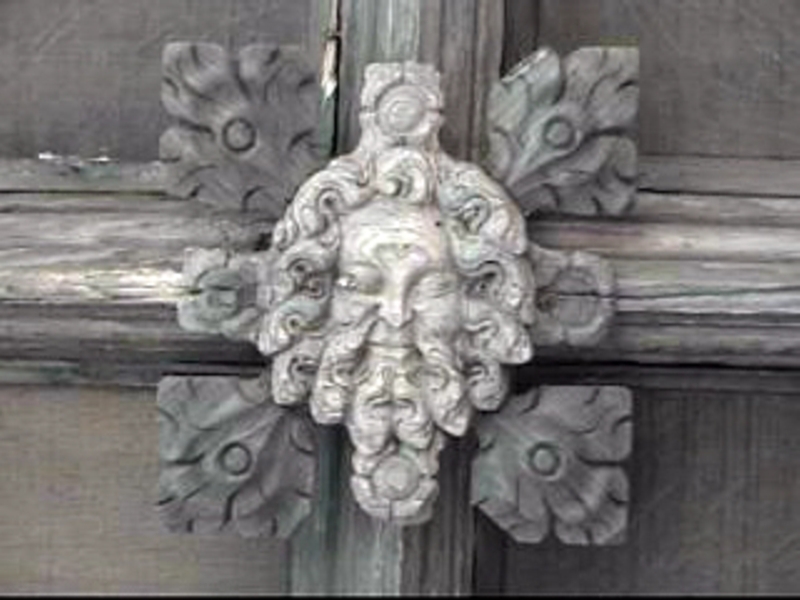 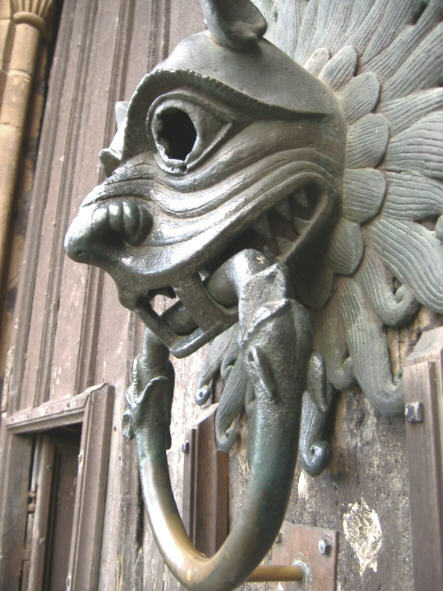 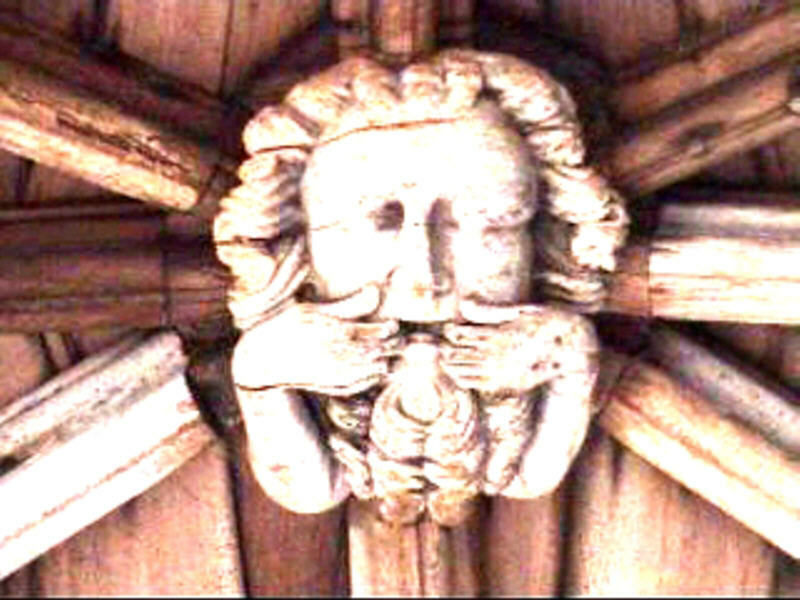 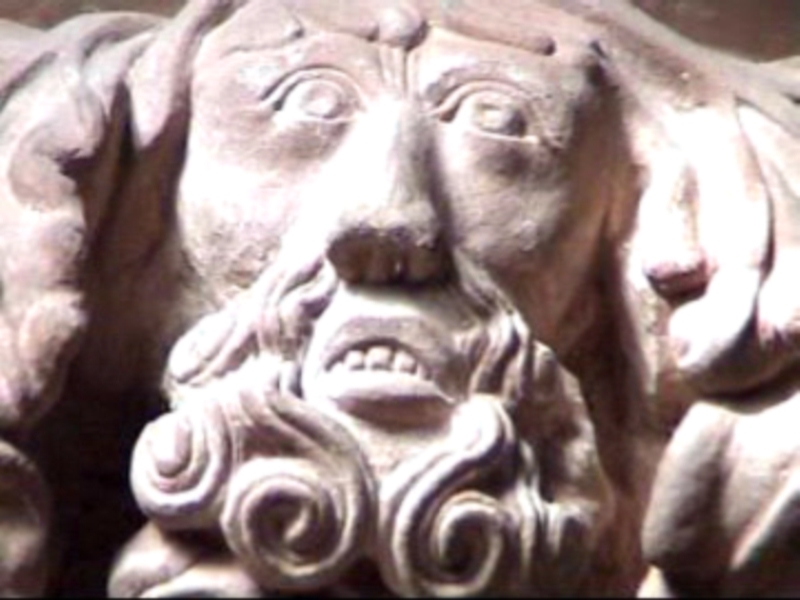 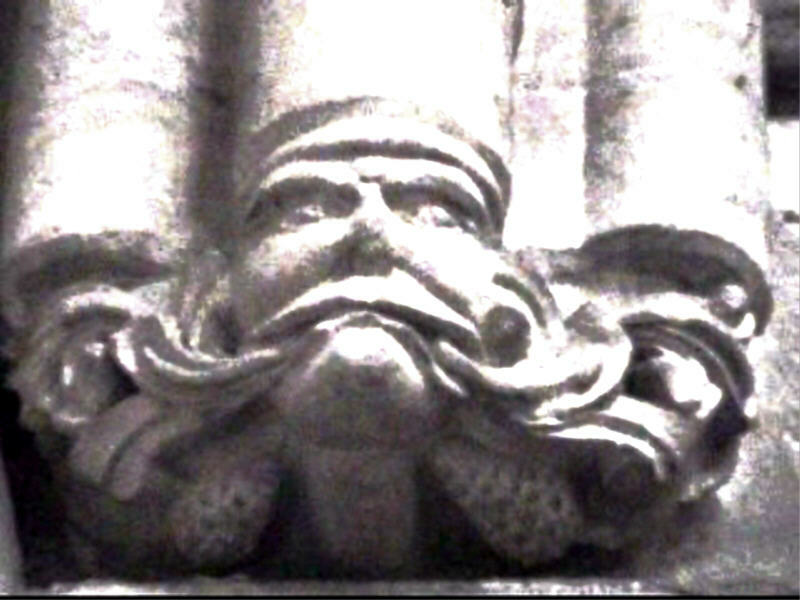 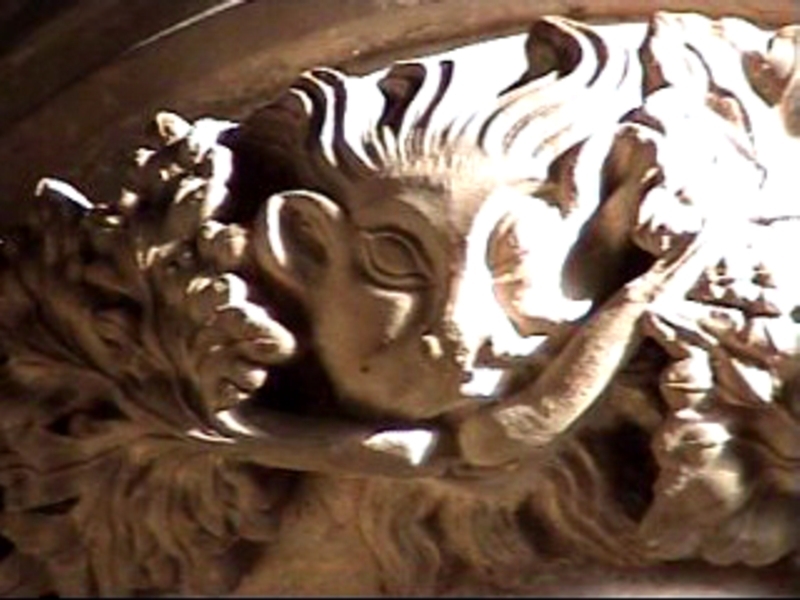 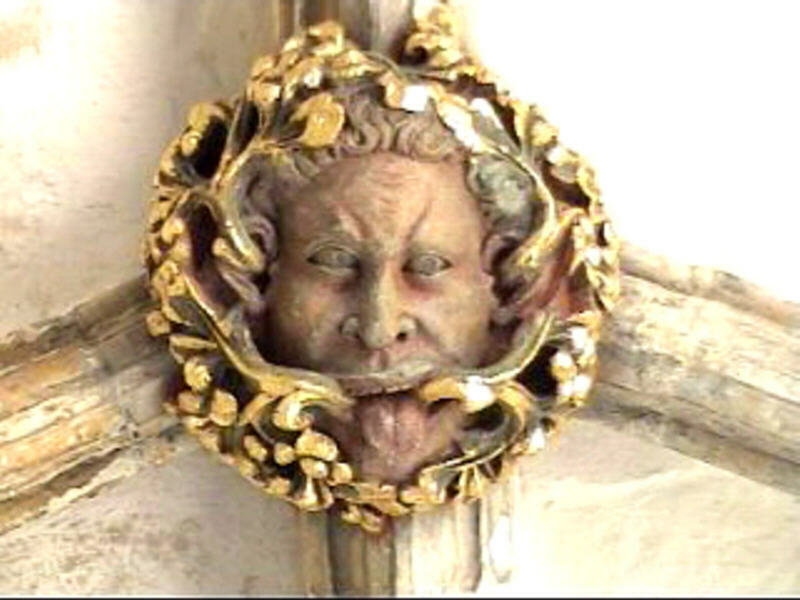 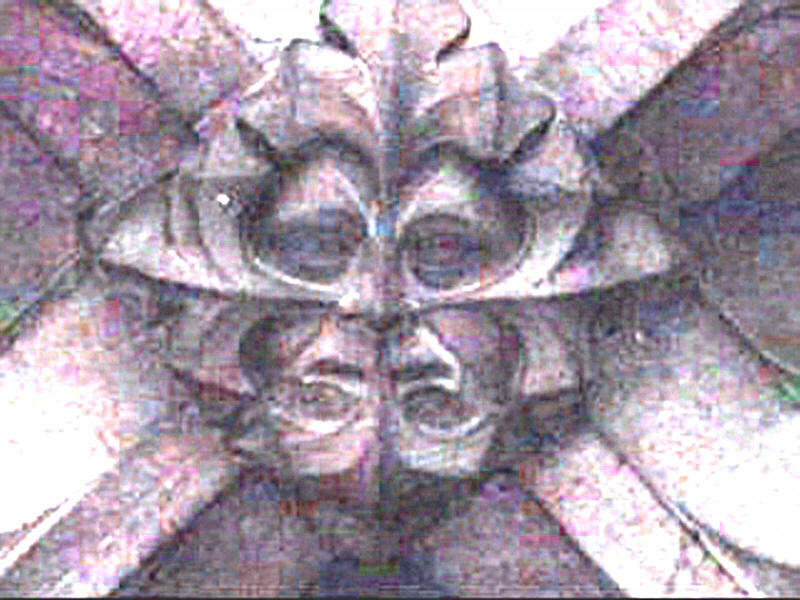 My remit is to concentrate mostly on Green Man-type images, but if anything suggests itself as a suitable companion or possible analogue (such as the Sanctuary Knocker at Durham Cathedral or the double-horn blower from the cloisters of Lincoln Cathedral, which is often mistaken for a Green Man) then I'll be sure to include that too. 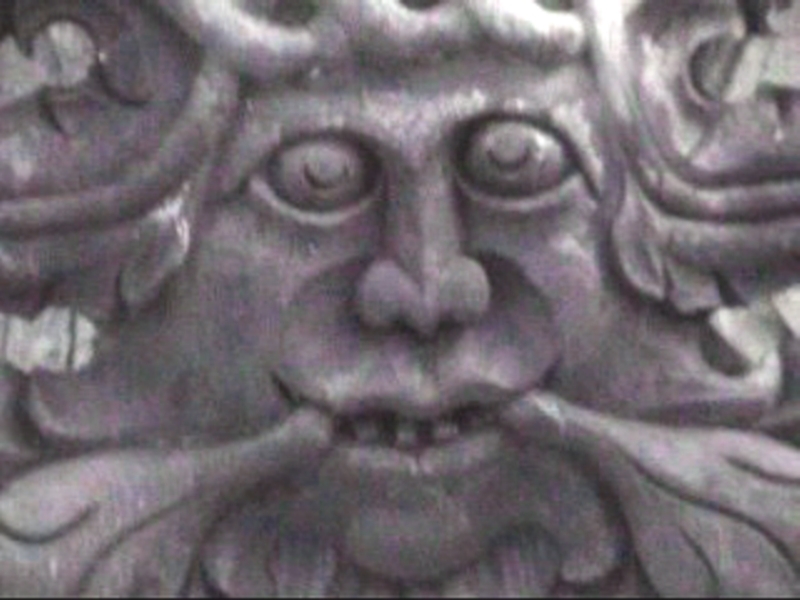 1 - Kathleen Basford - The Green Man (D S Brewer, 1978) - Page 18. 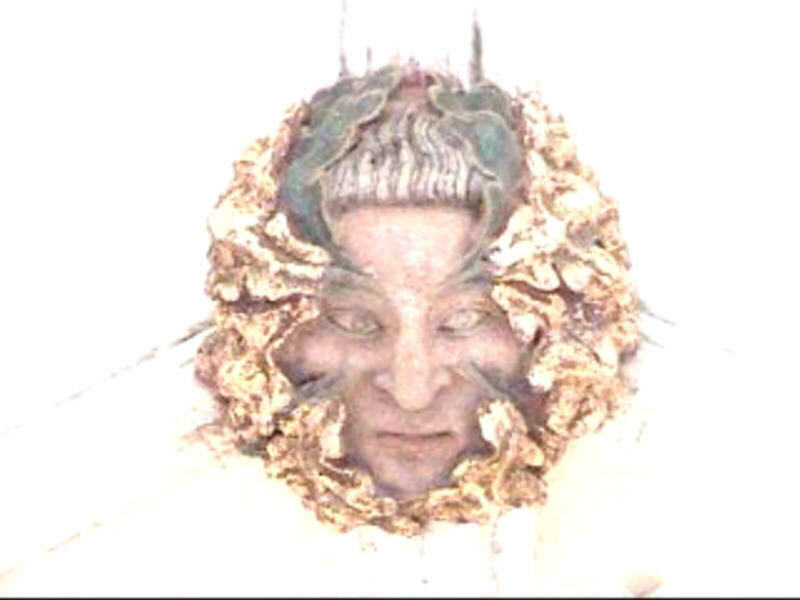 2 - Brian Stone (trans.) 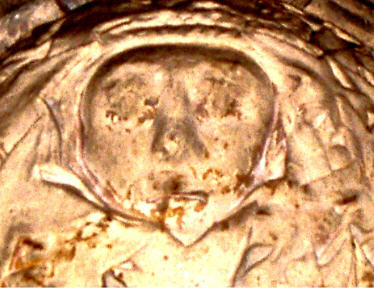 - Medieval English Verse (Penguin, 1964) - Page 64. 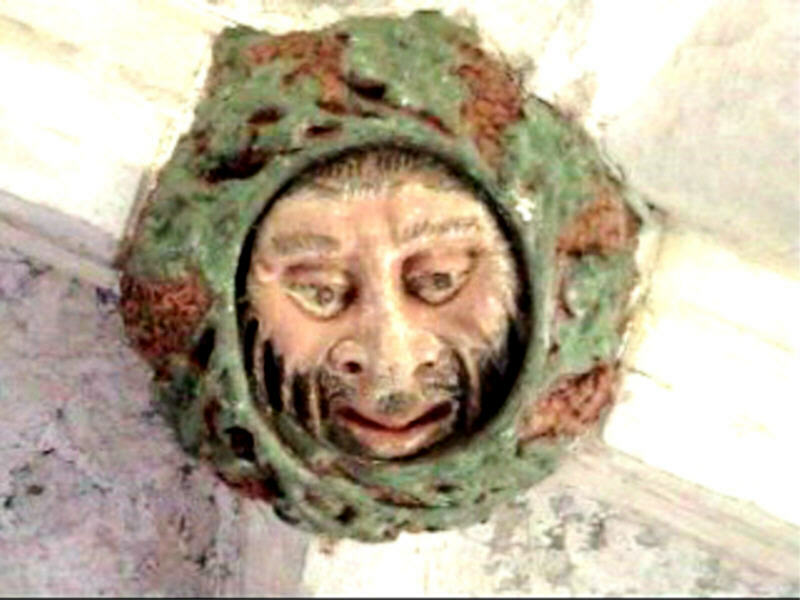 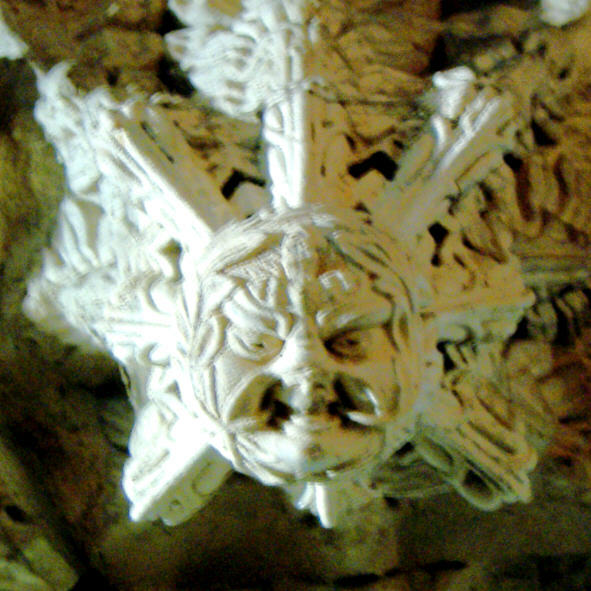 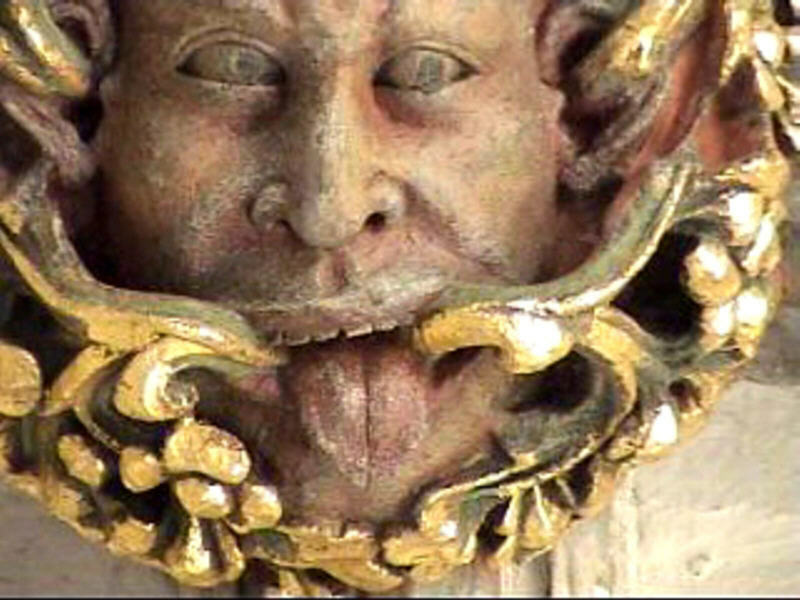 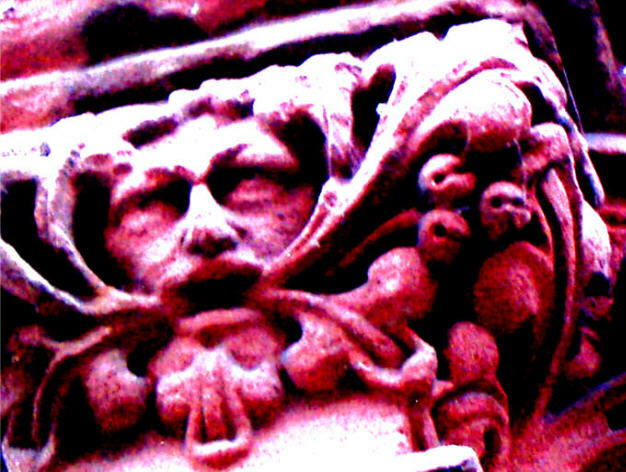 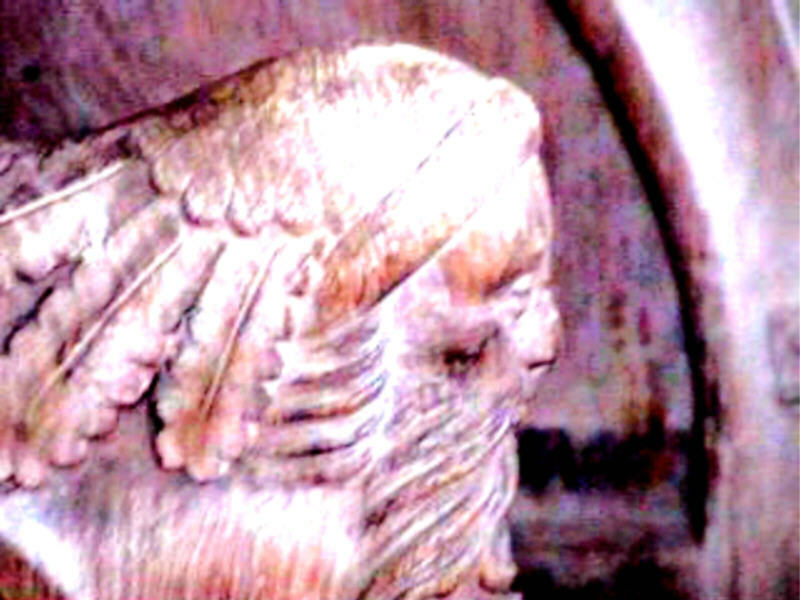 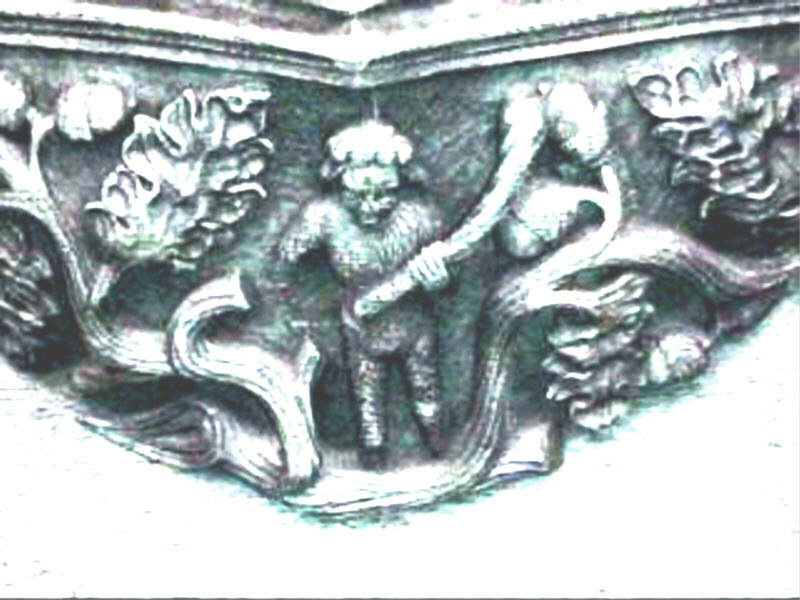 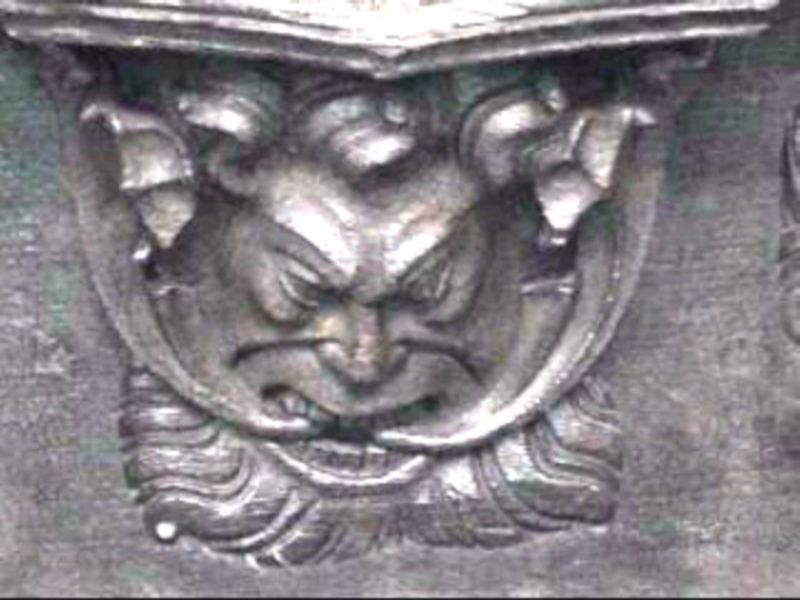 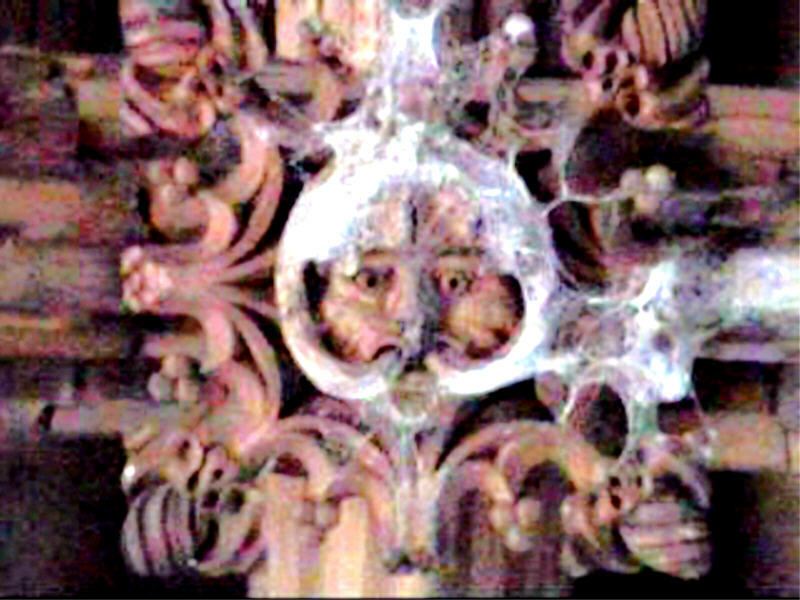 Click on image above for PDF of my article 'The Devil in the Details: Being A Potted & Personal Overview of the Foliate Grotesque Otherwise Known as the Green Man' - a slightly modified version to that which appeared in the magazine Folk Leads to Song & Custom #6 (Spring 2007). 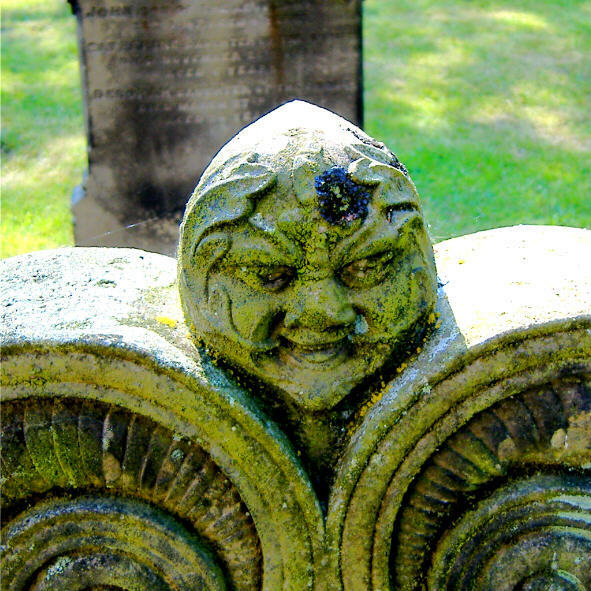 "All you that do this place pass bye, remember death for you must dye, as you are now even so was I, and as I am so that you be". 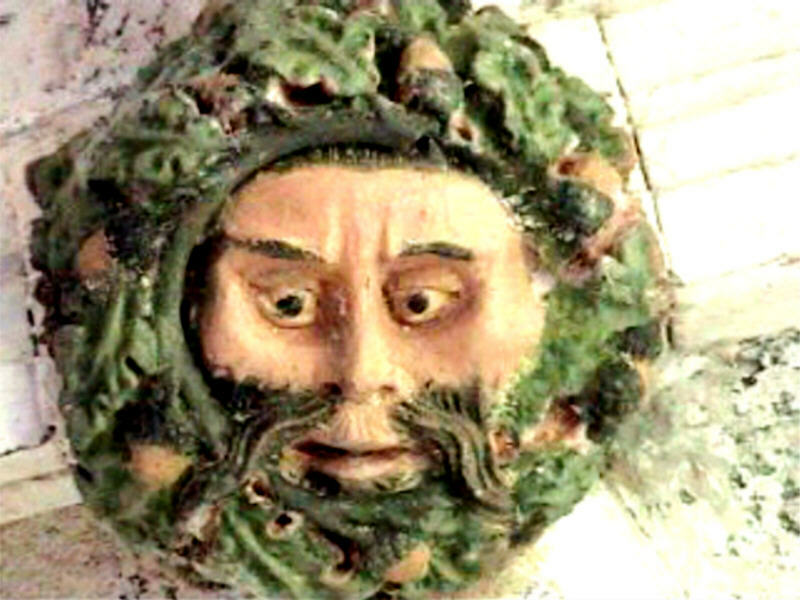 With thanks to Caleb Leeke & Steve Cousins, Green Man potter extraordinaire - see his website The Green Man Pottery . 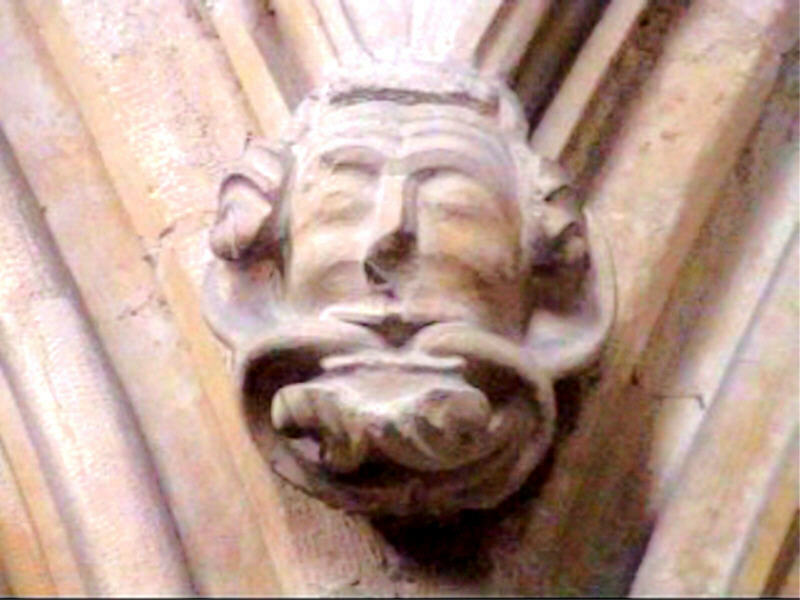 Lincoln Cathedral Cloisters, chapels etc. 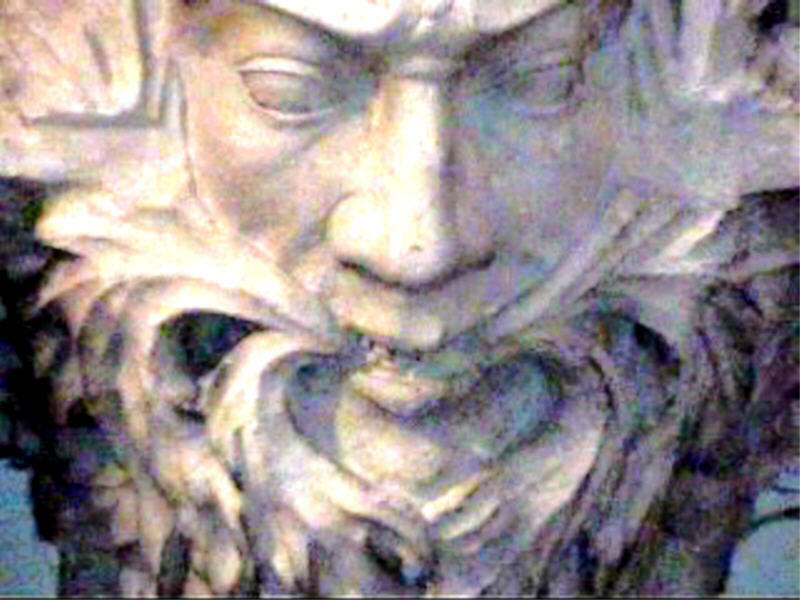 Sean Breadin, aka Sedayne, is a Professional Storyteller, Singer of Traditional Ballads & Folk Songs and Player of Diverse & Ancient Musical Instruments. 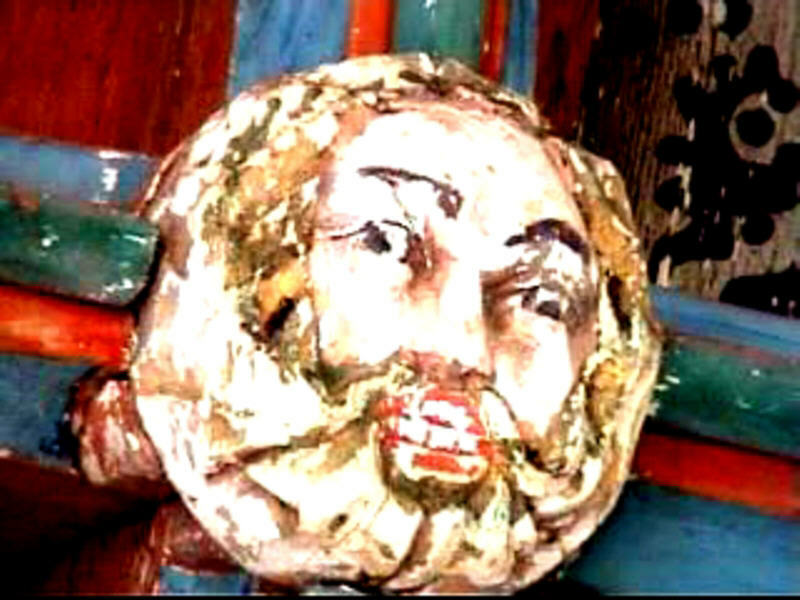 Click on picture above for resume.